I think I’ve been pushing the envelope in my latest insanity. 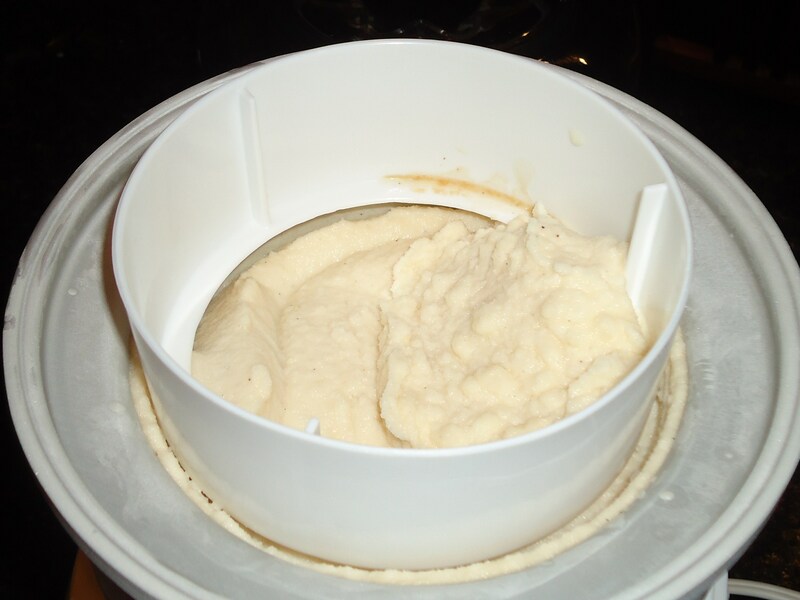 On Sunday, I made up this raw ice cream, which was absolutely delicious. But last night, in the fury of studying, things got a little… wacky? Considering I didn’t have half the ingredients for real ice cream and made this with no patience, it was actually pretty good. It tasted nice and sweet and hit the exact spot I needed it to. 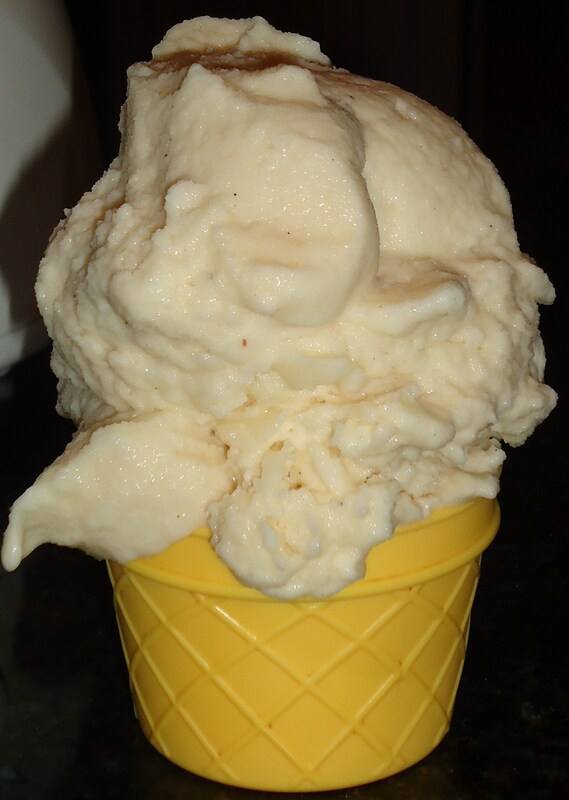 It might not have been thick and creamy, but actually it came out much like a Wendy’s frosty. Yum! 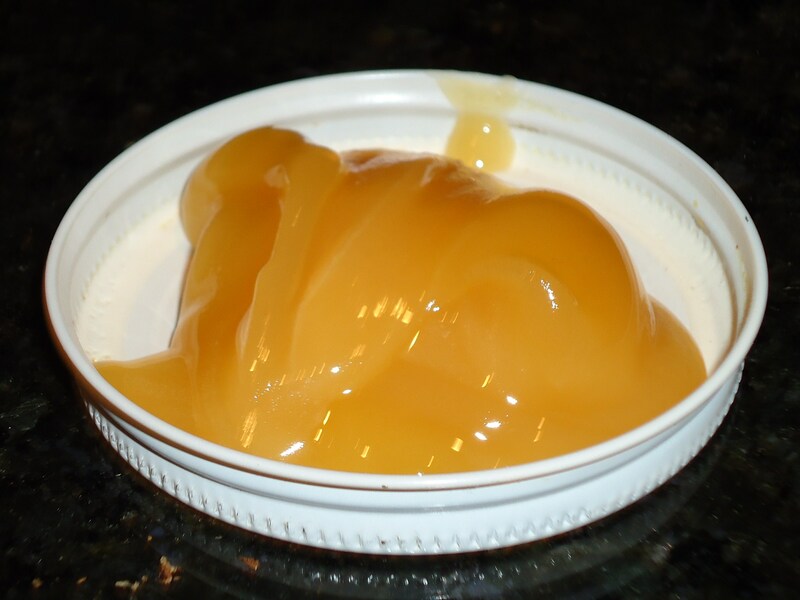 While I was waiting for that to churn, I snacked on some local, raw honey. Is it bad that half of the 1lb honey jar is gone?… I think I’m more concerned of the fact that the farm isn’t open until Thursday. Boo. And to end the night of studying, I had some warm carbs with Justin’s chocolate almond butter and coconut milk, and some cool carbs with an organic peanut butter chip granola bar. Can you tell I was nervous for the test much? 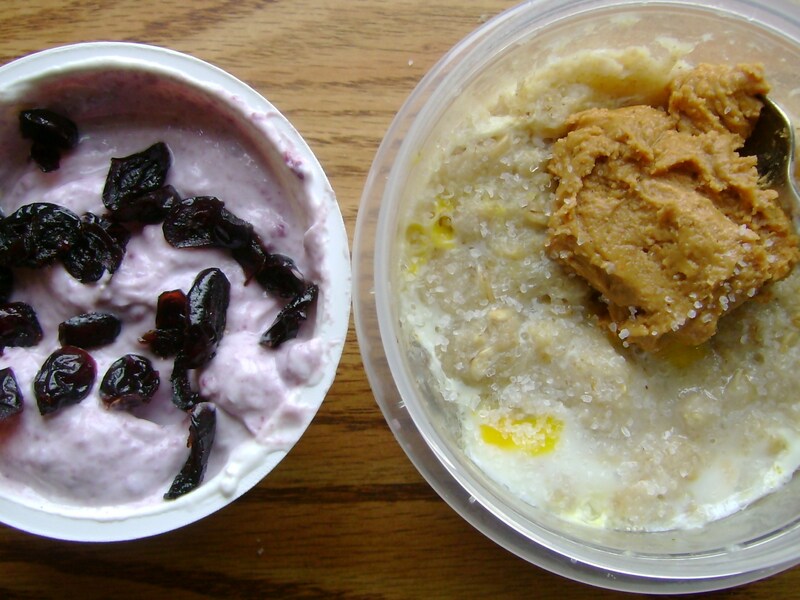 For breakfast(eaten in the car), I just cooked oatmeal and topped it with Naturally Nutty‘s chocolate cherry peanut butter and had a plain Oikos with cherry butter and Whole Foods’ trail mix. 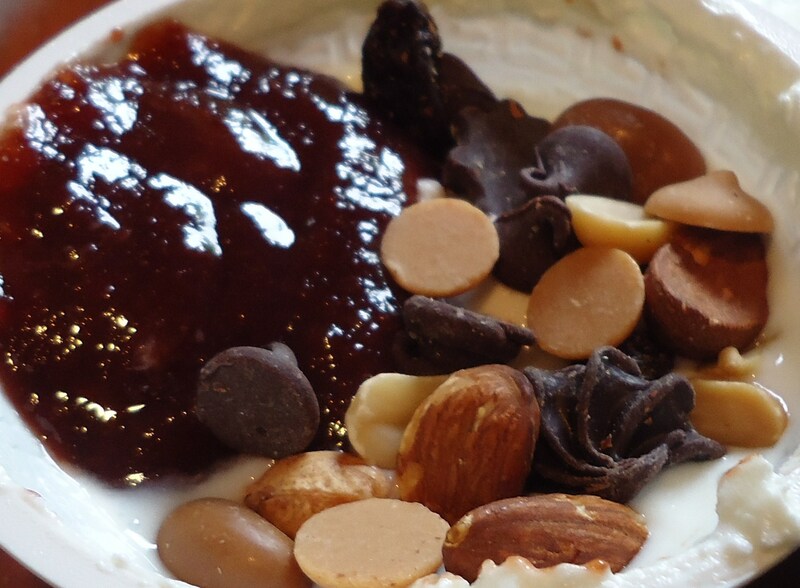 I love getting the plan yogurts because they’re so versatile! Except I had to sweeten the cherry butter because it’s a bit tart on its own. All together it was delicious. 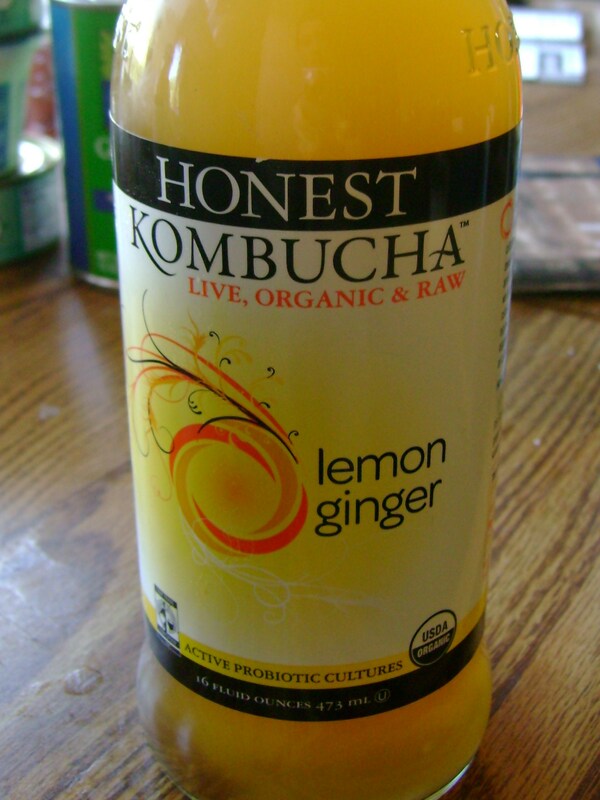 During the test, which took 2+ hours, I sipped on a gingerade kombucha. Let’s just say I am very glad to be done with that one. It was just an awful scenario. Part of the test was answering essay questions, and the questions we had to write on were chosen by the roll of the dice. And it was not lucky snake eyes. Whatever. It’s done and I’m free! To celebrate, we were supposed to go out and eat. But I chose the Whole Foods salad bar instead of a restaurant. Wouldn’t you?! 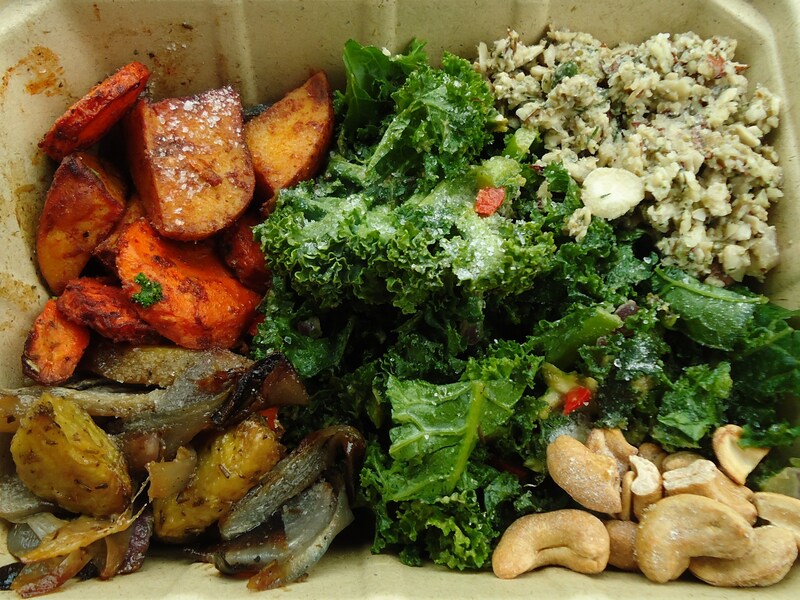 I got kale and avocado salad with raw vegan tuna salad and roasted cashews, and 2 types of roasted potatoes. With all those potatoes, stick a fork in me, I’m done. 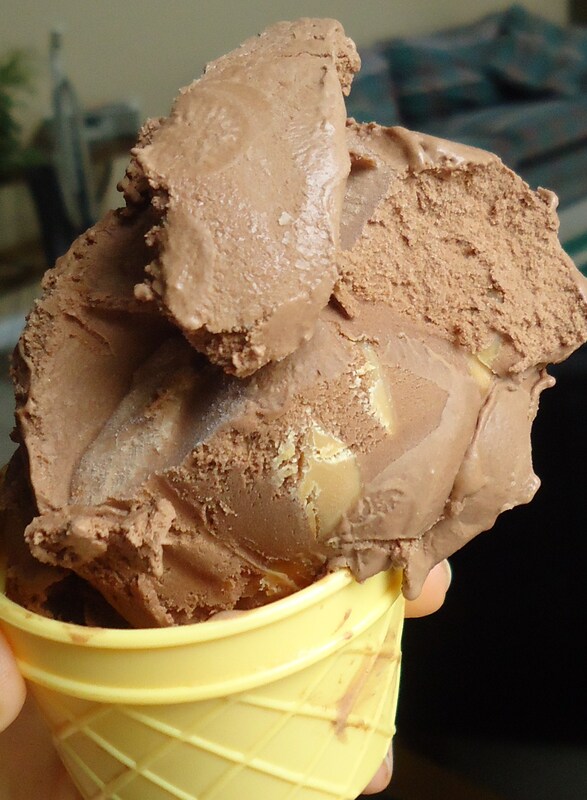 After an afternoon of getting groceries, I was happy to be home for some Luna & Larrys chocolate peanut butter ice cream. There was a little left in the container so I told my dad to finish it. He declined, licked the spoon I used to scoop it, and then took back his declination. Yeah, I think he approves of it. What flavor should I try next? 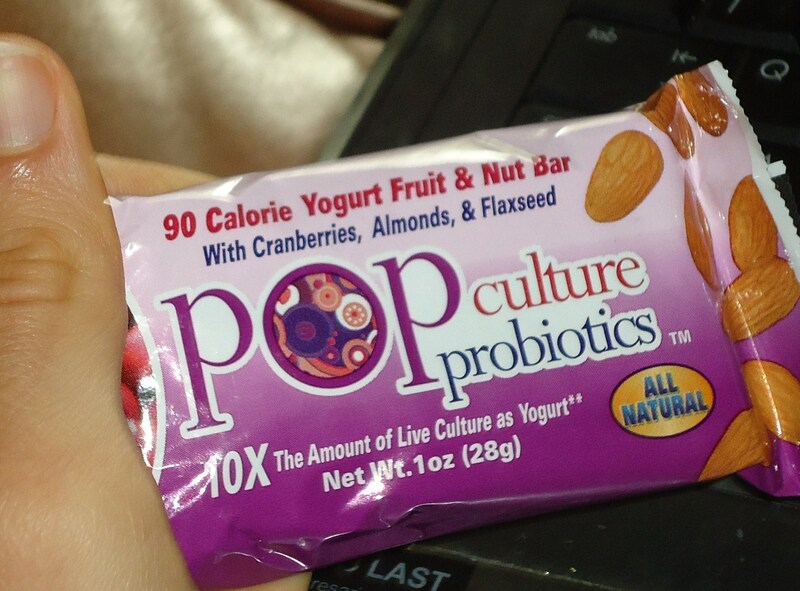 Waiting for dinner, I snacked on a Yogurt Fruit & Nut Pop Culture bar. 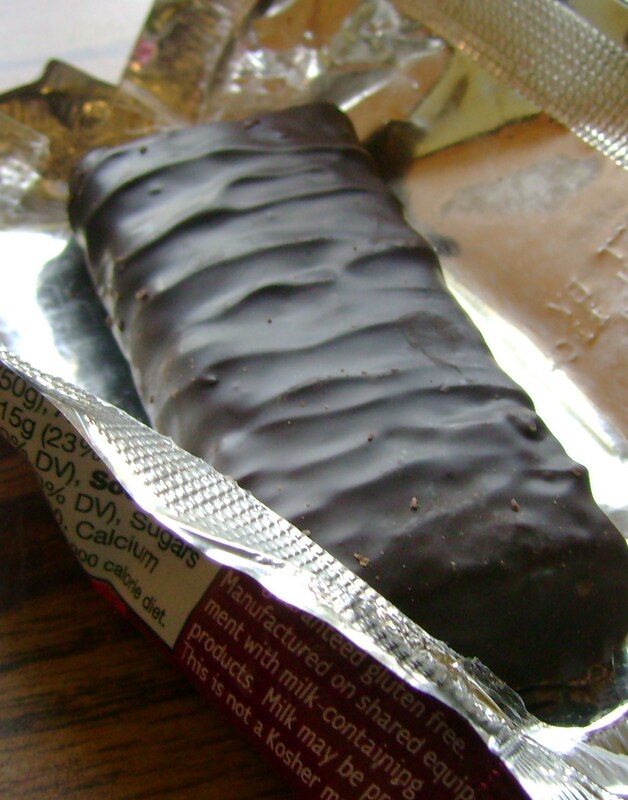 I forgot all about these while I was at school; they’re good for a little snack. But I didn’t realize they contain gluten! Whoops. Aw, well, I’m already bloated from all the stressing it’s hardly going to make a difference. 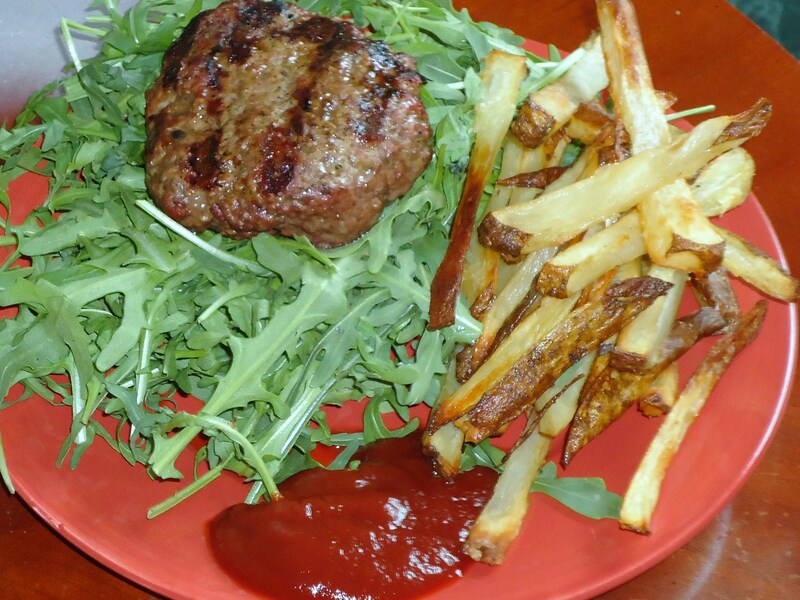 For dinner, I bought something else but ended up craving a burger and fries. This would have gone great with my raw milk frosty. Anywho, these were some of the best fries ever. 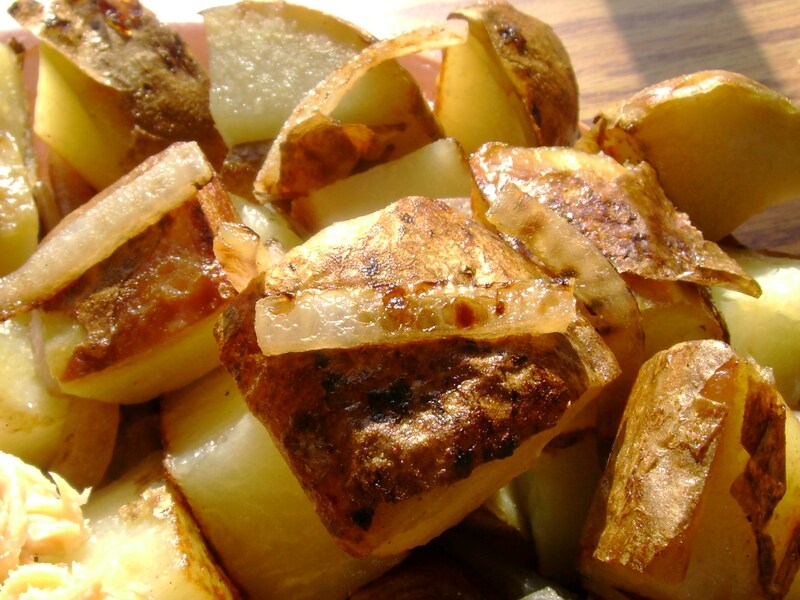 And all they were were potato coated in EVOO and baked for about an hour! But seriously amazing. I timed this well, too, because as I was grilling the showers came in. Summer rain: love or hate? I would hate to have to run in them. But in general, summer showers, a little lightening, and a Little People, Big World marathon would make for the perfect night. I noticed a funny thing yesterday. My jeans which have always been a bit big are starting to fit better, and the ones that have traditionally fit well seem a bit tight and uncomfortable. Being a guy, my first two thoughts were a) I’ve been shrinking everything in the laundry or b) someone else had them be altered to mess with me. That’s when option c hit me. My gut response was the typical “healthy living blogger” way of seeing it: I’ll eat out a little less, cut down on the sugars, and things will go back to the way they were. And then I thought about it. What if I didn’t adjust to fit the pants; what if the pants adjusted to fit me? I’m still healthy and eating my superfoods. I’m running faster and further than ever before. And I’m enjoying eating out including brunch at fantastic new places. In short, why would I want to change any of this? I love this! Underneath clothes, we’re all naked; what does it matter what size they are? Be healthy, but be happy. And if happy leads you to a shopping spree at that incredible French clothing store, Targe, with a buttload of gift cards to get jeans from the 75% off rack, so be it. Who else is willing to throw out the old and put on the new with me? Not only did I go to Whole Foods last night, I ate out, too. This was my last dinner of Providence, so I was prepared to make it a good one even if I had the ingredients for something much more humble back at my room. 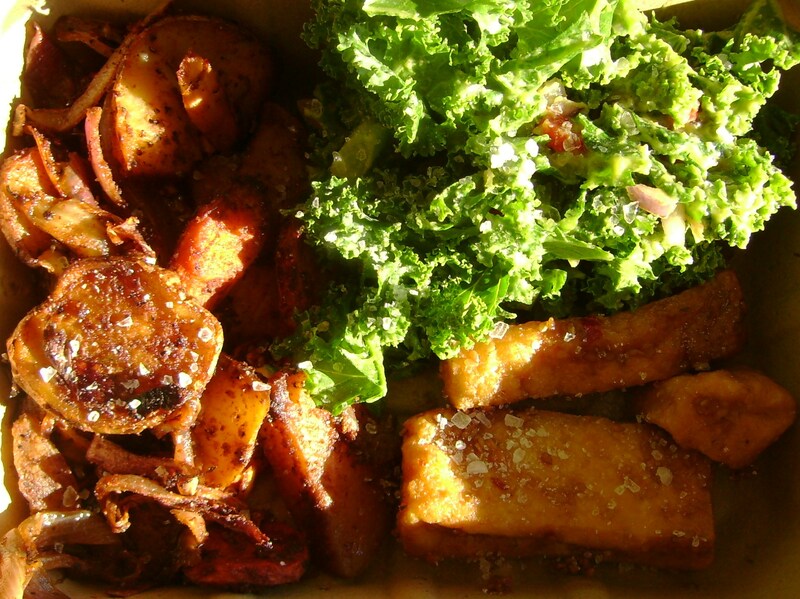 I got from the salad bar roasted carrots, potatoes, and onions with paprika, avocado rubbed kale, and golden sesame tofu. All delicious. All making me grow out of my pants. All good. They didn’t have the coconut almond chip coconut milk ice cream I went all the way to get. Bummer, right? I was pretty let down. 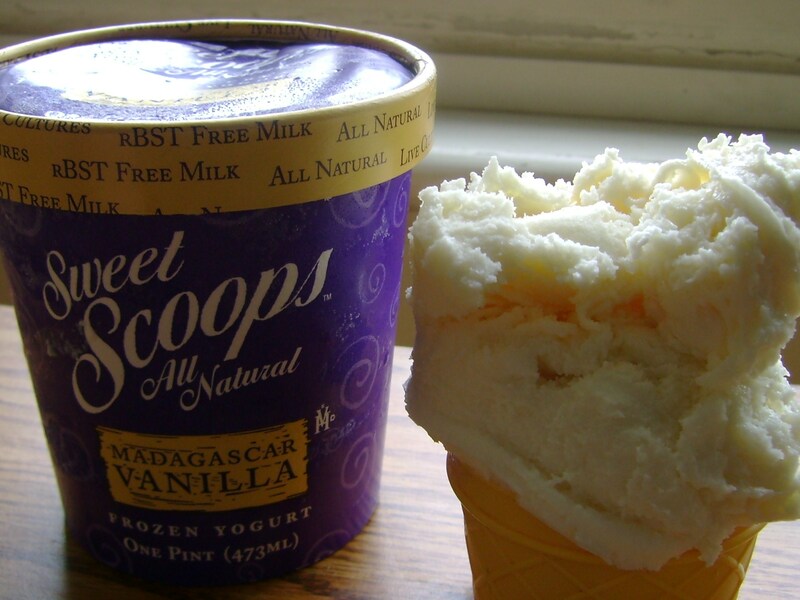 That’s when I made a plan and got the regular coconut ice cream and add Tierra Farm‘s almonds. I really liked the bare coconut flavor. 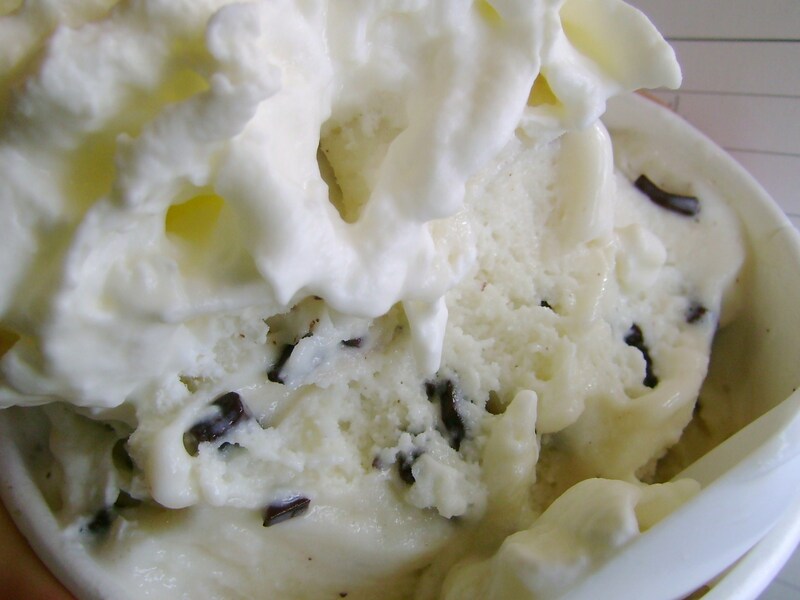 This ice cream had just 6 ingredients and 11g of sugar per serving–unreal! It was a little chewy even because of the coconut flakes. 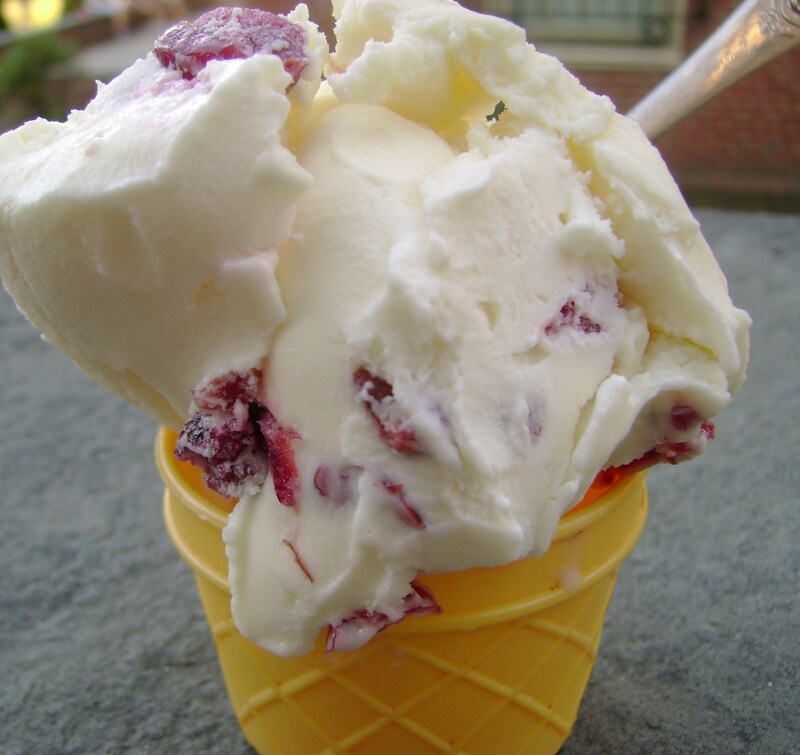 It was definitely a good ice cream for anyone who likes to add their own mix-ins. 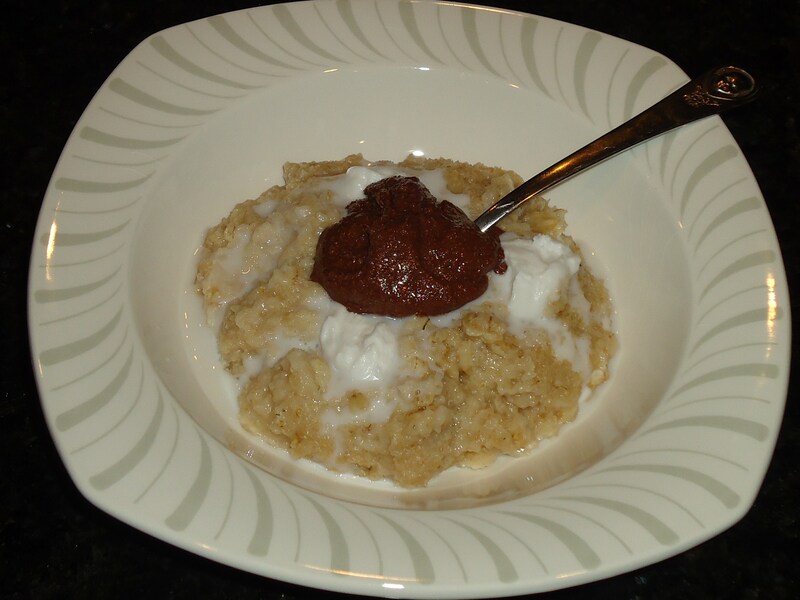 I never got hungry for oatmeal, but I did still want the nut butter and I can always go for chocolate. 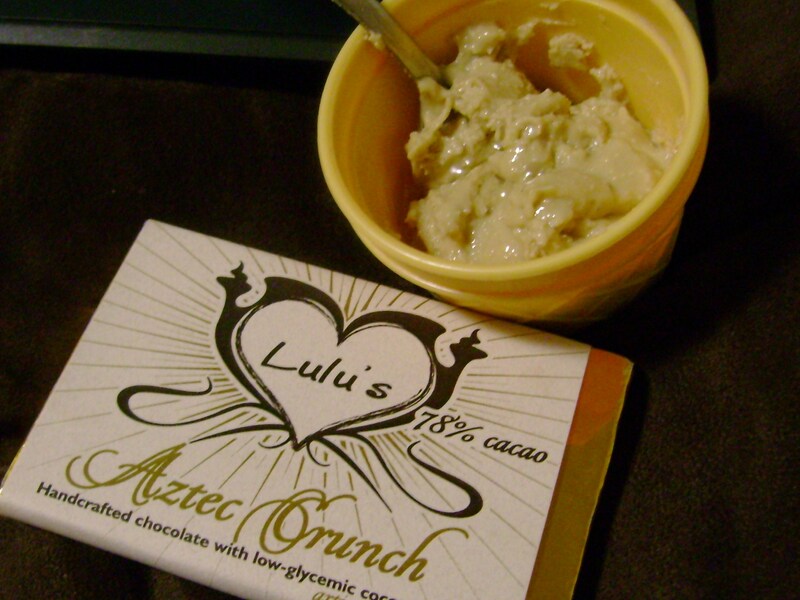 I was worried whether I’d like Aztec Crunch because I’m not a fan of raw cacao nibs(part of the crunch). But this really blew me away. It was raw, but not bitter. It definitely had a solid crunch. One of the ingredients is said to have magical soothing powers; I’m not sure if it was the chocolate or the ingredient but I was definitely soothed. Of course, the other side to new pants is the completely metaphorical side: fitting your surroundings to fit how you want to be. 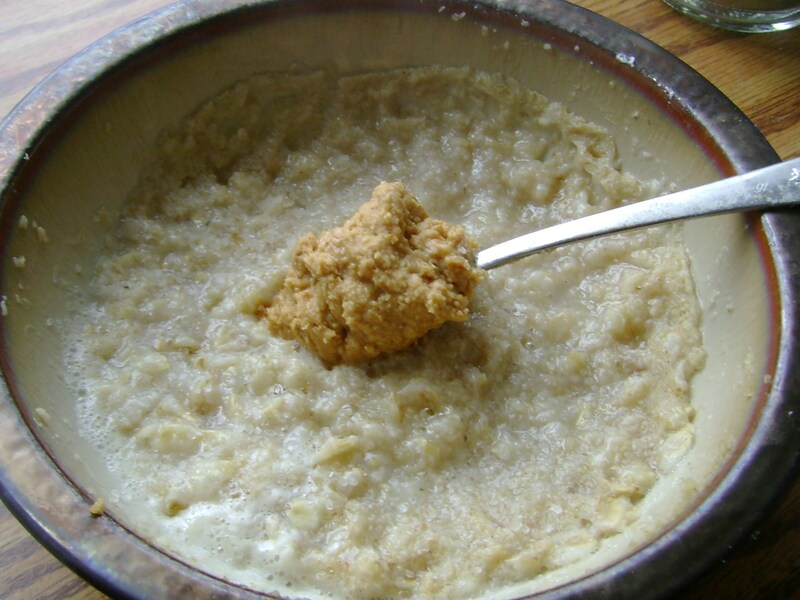 As much as I love oatmeal, I’m willing to toss it by the landside if I’m craving something else. And this morning, I had a huge white potato craving. 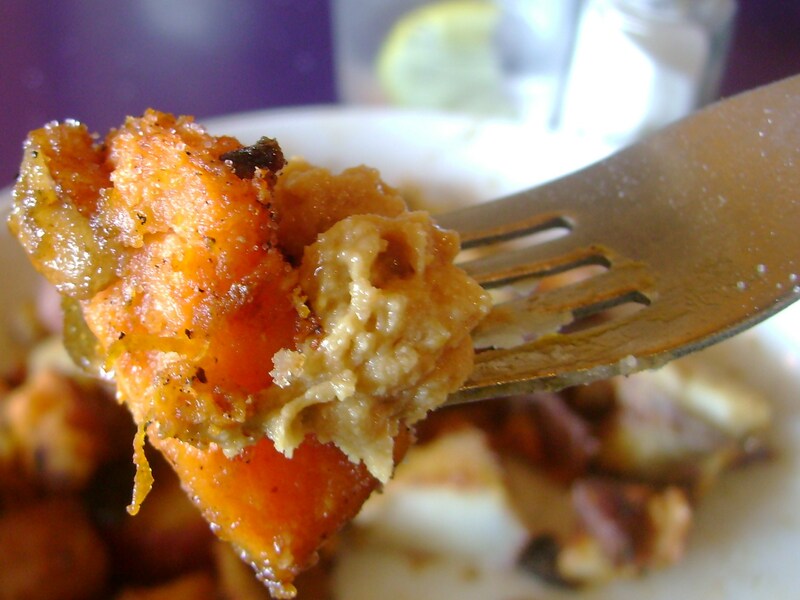 Home fries, anyone? I think I’m still getting past the shock and awe that I made these and not some restaurant, because they’re so delicious. 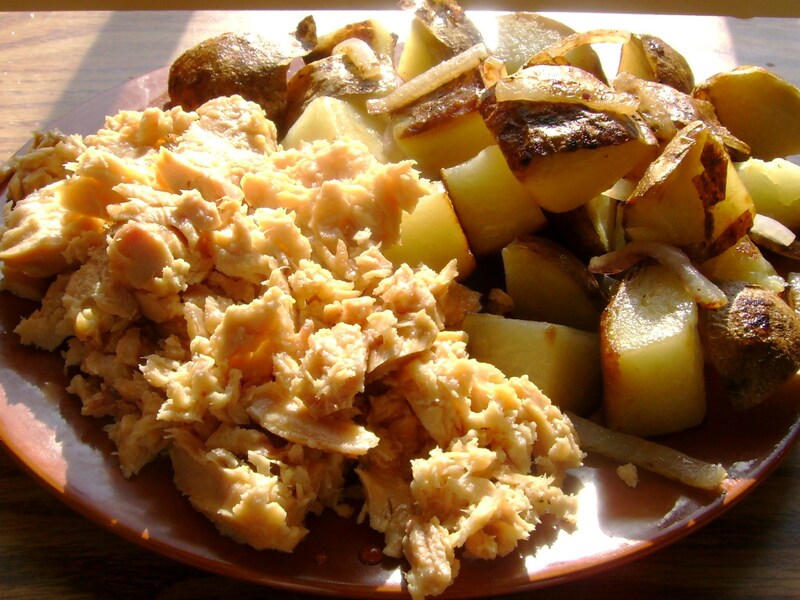 It was just 1 1/2 white potatoes tossed in a pan for a while with some red onion in EVOO. It would be great with sage or rosemary but I didn’t have any. 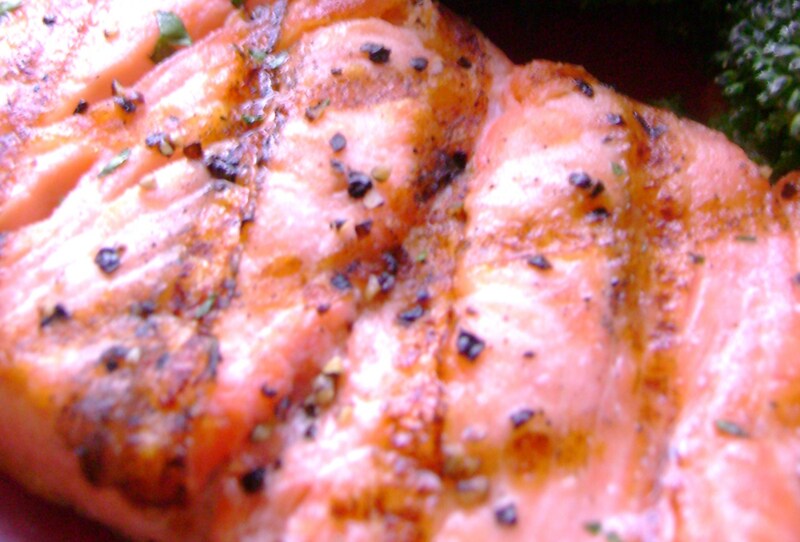 To make this more of a meal and less of a breakfast, I added flaked salmon with maple syrup and sea salt. Definitely not as good as the home fries; but that’s where the extra maple syrup comes in handy. I ran a well-paced 8 miles while watching the newest Dr. Who(This episode freaked me out! for anyone else likewise addicted). I wanted to push it to 10 or even 12, but I just new my legs would appreciate me so much more if I didn’t, so I saved those miles for a rainy day. I had some time before my family would arrive so I refueled with a blueberry Chobani and Better Than Roasted sprouted almond butter. Blueberry and almond is such a magnificent combination! 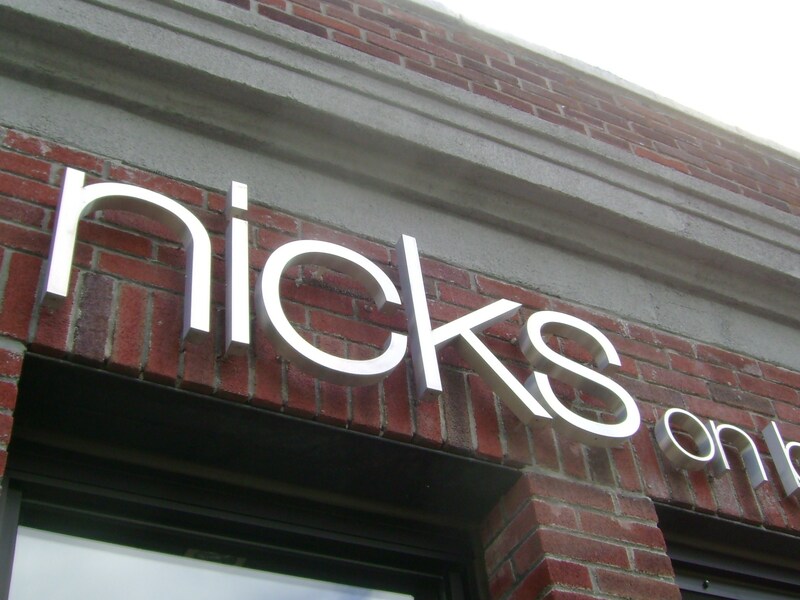 Despite being in Providence almost a year, I haven’t been able to get myself to Nick’s On Broadway until today. It was highly recommended by Heather and Sabrina and was voted in the top 59 breakfast places in America! Even though the wait was an hour, I had a feeling it would be well worth it for Mother’s day brunch. 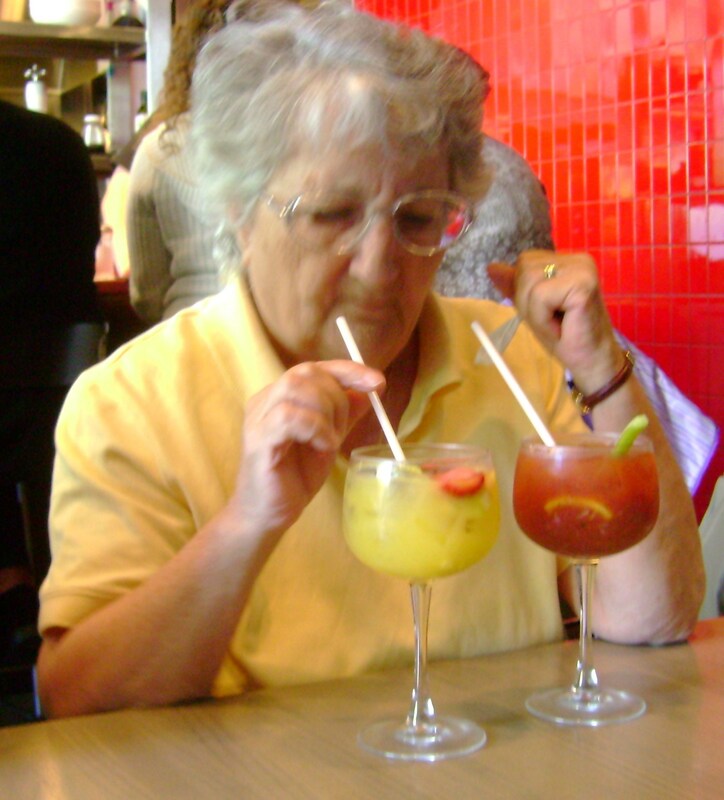 That would be my grandmother with both a sangria and a bloody mary in front of her. She actually ended up with neither and drinking a decaf coffee instead, but I thought the photo was funny 😉 I sipped the bloody mary and even though I have nothing to compare it to I have to say it was really really good, and that’s from someone who hates horseradish. My one complaint was that the decaf coffee, which I did have, wasn’t terribly hot at all. I was so excited for my meal. I ordered a local cut of beef with a side of homefries. Between Providence and the Garden Grill Cafe, I’ve grown a love for homefries and had to try Nick’s; they were deliciously and not overly oily at all while still being crisp and delicious. 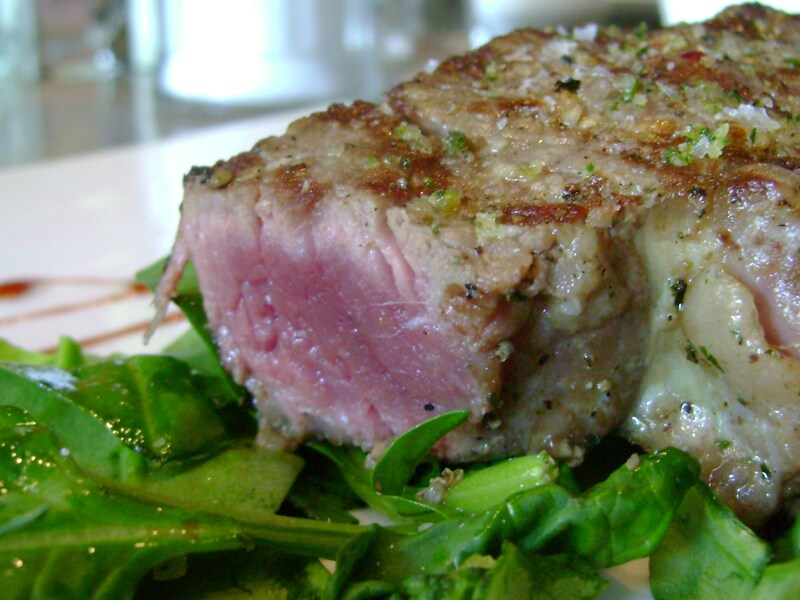 The beef was perfectly cooked and seasoned, with a nice herby crust and a rare center. I love the emphasis on local, which is something I’ve found a lot of in Providence. It’s easy to want to eat from within your own state when it’s the smallest in the country 😉 On the way out the head chef, Derek, wished us well and a happy Mother’s day, which I thought was a great, personal touch. Overall I had a fantastic time at Nick’s and can’t wait to go back again. We did some grocery shopping and I had a HUGE craving for what was in the bag. Can you guess what it might have been? Ice cream! The real, dairy deal. No coconut milk would have sufficed for me, and this was so good. It tasted like straight up vanilla extract, which I know a certain blogger would appreciate if she could tolerate dairy. 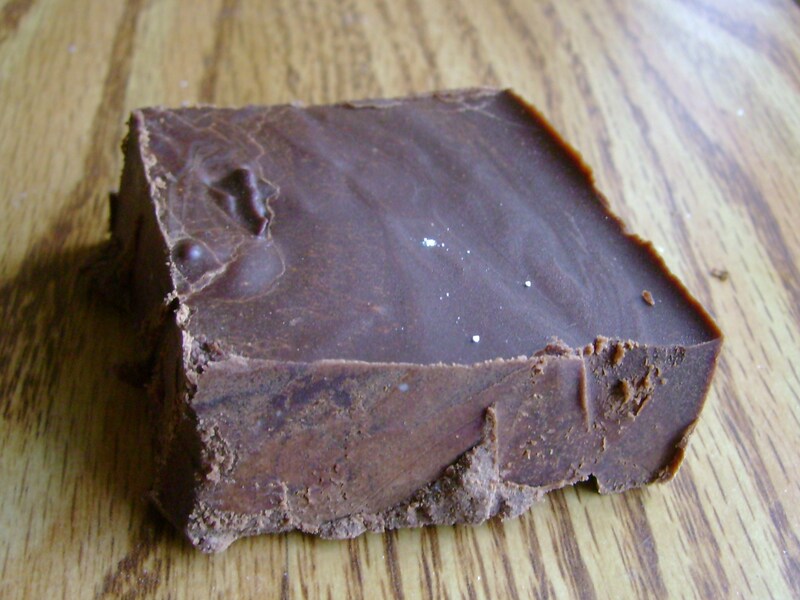 And now for my dessert-dessert, I’m eating the last piece of microwave vegan chocolate fudge. This would be such a sadder moment if I didn’t also pick up earth balance and have something in the fridge cooling at this very moment 😉 Check back tomorrow for a new and delicious recipe! And now I need to get back to Leap Year; I have 3 hours before it expires which worries me even though it’s only 90 minutes long. What do you order at brunch? I don’t usually crave eggs. And as much as I love the smell of toast I cant tolerate the gluten. 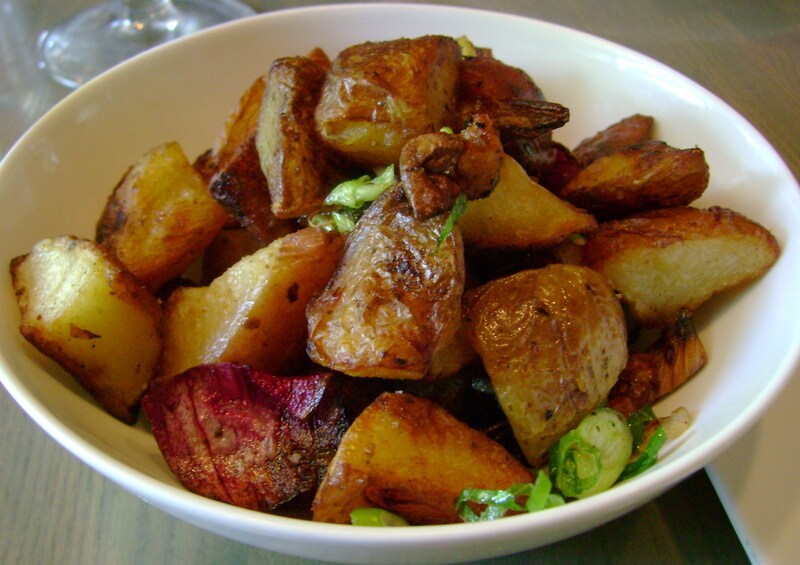 But one thing my brunch has to have is homefries. I’m awful at making them myself and, when they’re done right, I could eat them as my main course! 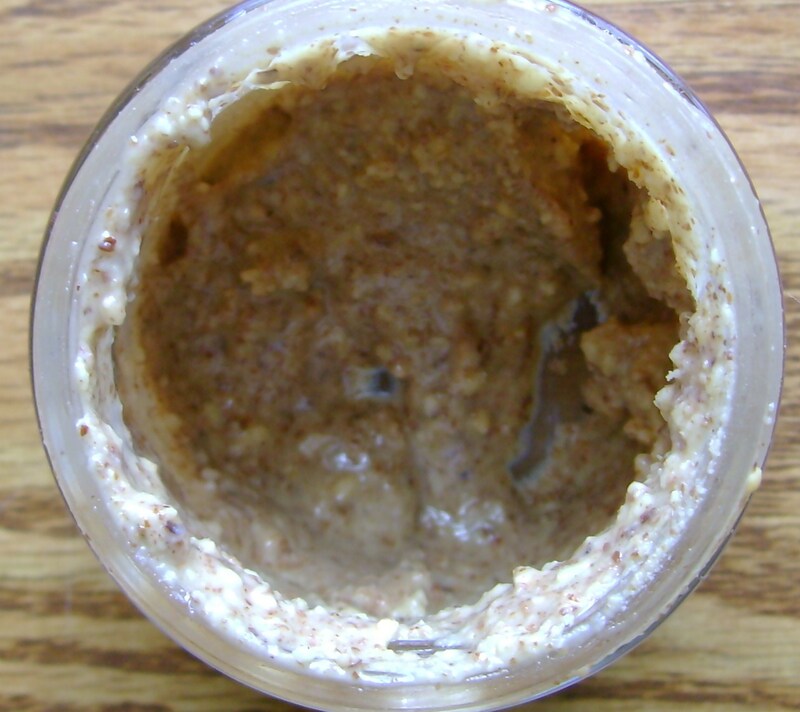 I’m really happy that so many of you seem to love your fancy nut butters! Sounds like there’s going to be a lot of experimenting in the kitchen this weekend done(and a happy Friday to you, too!) And if you think you’ve seen a post like this recently, maybe it’s because me and Christy are on the same wavelength when it comes to being ravenous. I kicked off my weekend the best way possible: Going to Whole Foods. Nothing is more relaxing than being at a grocery store even before the lunch crowd sets in. And I was tempted to buy anything and everything new I could find(like a new gelato Lauren introduced me to!). But in the spirit of Project Cleanout, I kept it nice and reserved. That would be oatmeal and oatbran(running low), an organic sweet potato, canned goods, a candy bar(whoops. 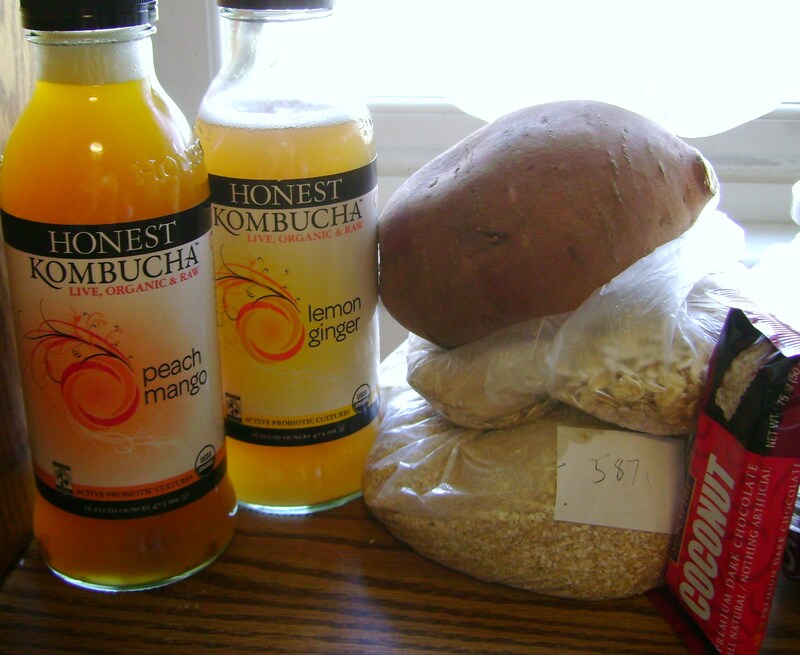 I had a coupon, though), prepared foods, and new kombucha that were on sale. I couldn’t help breaking into one of the kombuchas when I got hungry for lunch really early thinking I was just hungry from boredom. This flavor was good, but a little too sweet and lemony. I probably wouldn’t buy it again even on sale. And besides, I was hungry for food. The best thing about going to Whole Foods was getting a lunch so that I could just work on my final papers without thinking about lunch. Cashew chicken is definitely one of my favorite Asian foods, but the cashews here had no texture, and I’m pretty sure the gluten ingredient I didn’t think would bother my stomach did On the bright side, the cauliflower was so good. Please, Whole Foods, roast for me more often. 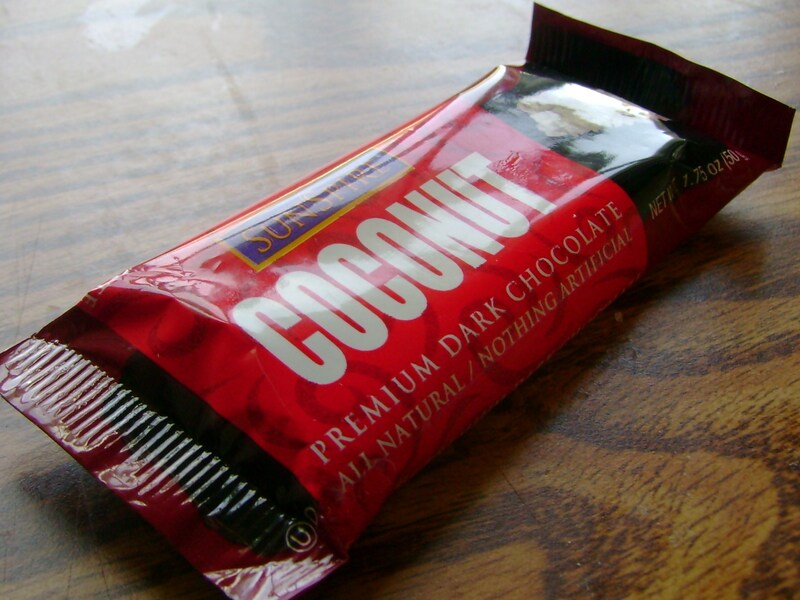 That filled me up for all of 30 minutes when I busted into my Cookie Friday treat: a Sunspire dark chocolate coconut bar. 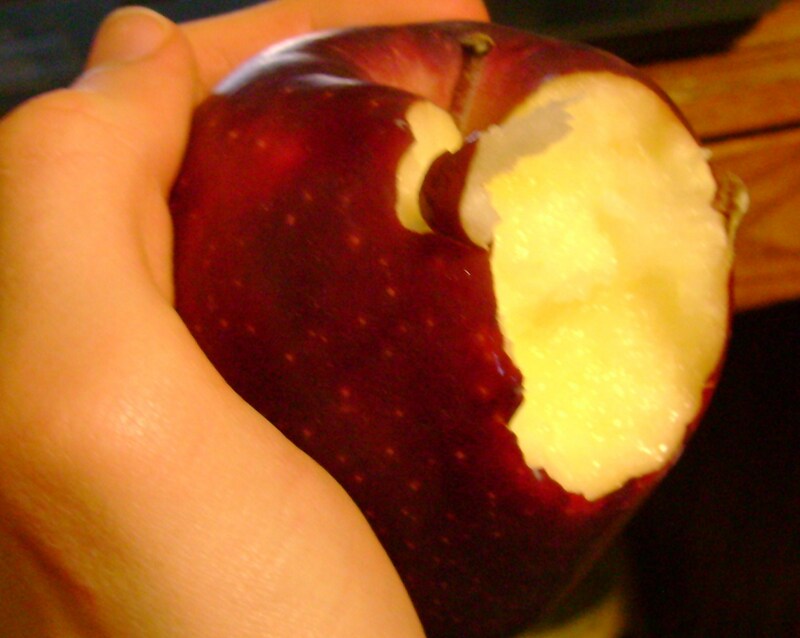 I was still hungry and decided to eat the last organic apple I had. Uhhh, I’m pretty sure this was turning into apple cider vinegar in front of my eyes. Does that look appetizing? Because it wasn’t(I still ate it). If there’s anything that gets my hunger going it’s rest days and doing serious school work. Not only did I not run today, but I finished two rough drafts of papers I have to write(hold your applause). It felt great to get those partially out of the way, but before I knew it I was making myself a huge Sundae Friday sundae. 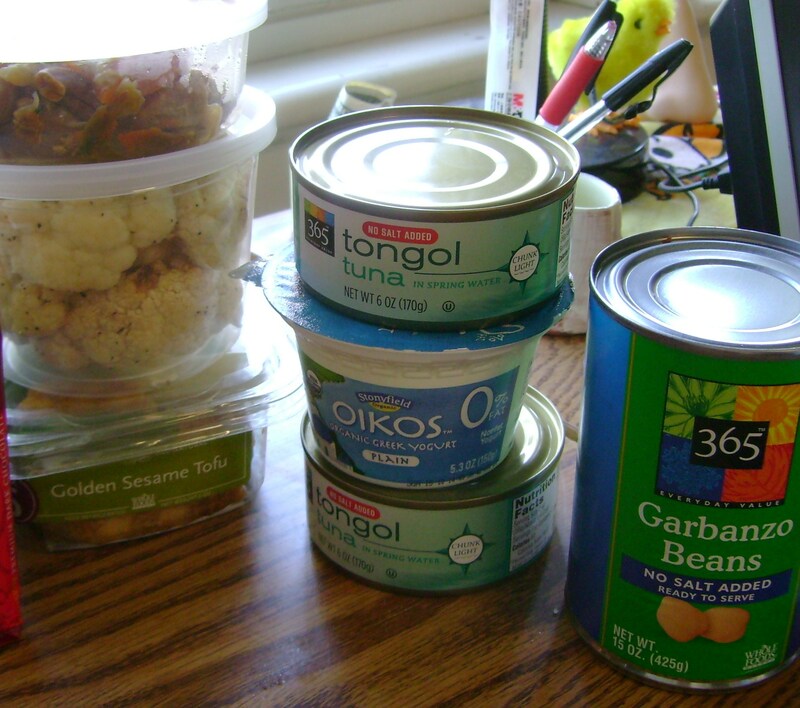 Since chocolate and ice cream and candy bars weren’t working(Gosh, I couldn’t imagine why), I decided to go down the protein route and have a can of tuna before dinner. 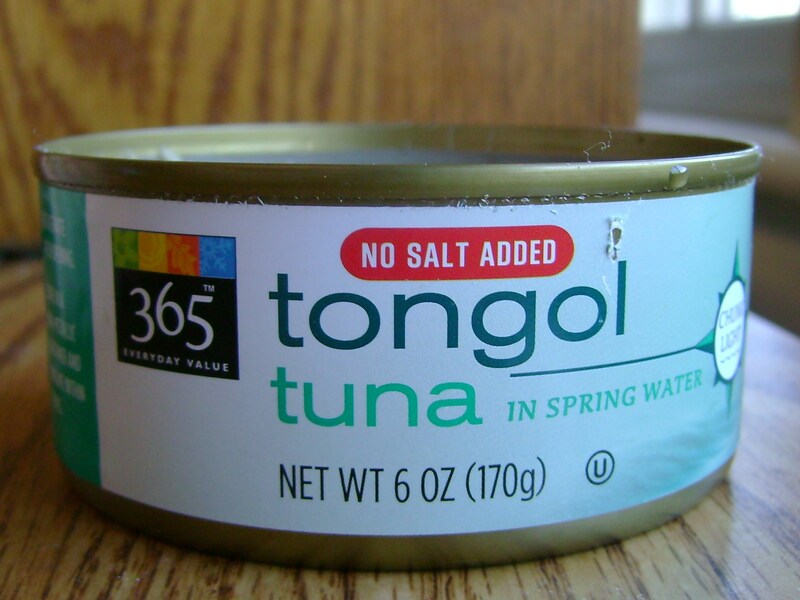 Proof that I am not a smart cookie: It took me about 3 minutes of shopping to realize this was the same tuna I’ve been eating all year, they’ve just changed the packaging of it. You like? I’m not a fan(because it confused me). Anyway, this actually worked to keep me full until dinner. Hello, Hello! 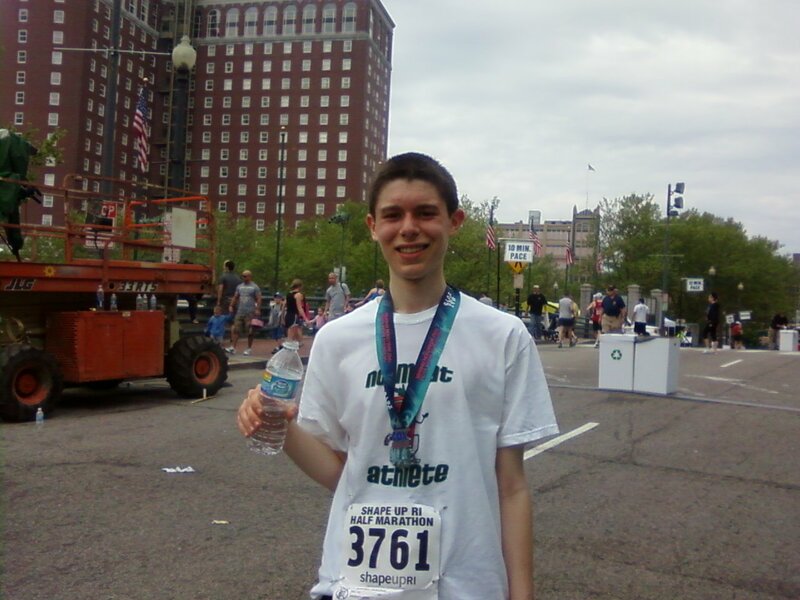 In case you missed it, here’s my race recap from this morning. My unofficial time is 1:37:29 but I’m still waiting for their website to update. 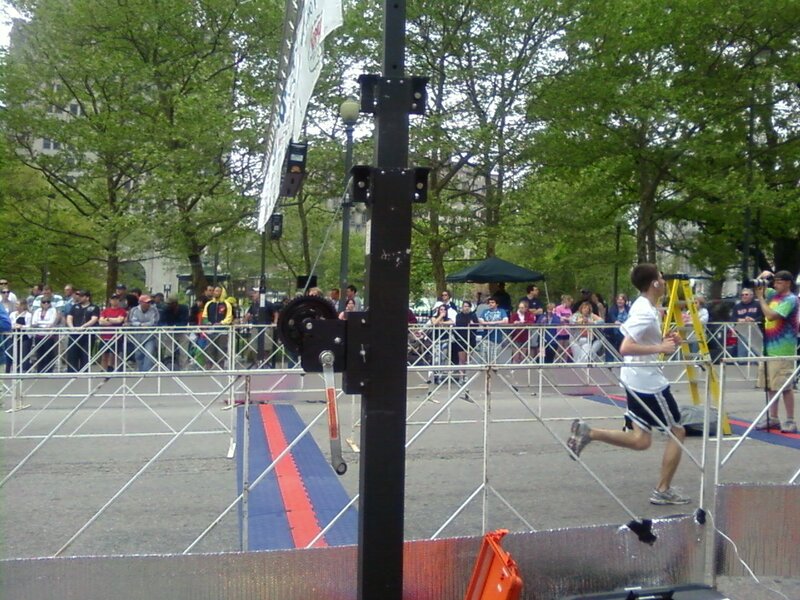 In the meanwhile, here are some photos my mom took at the finish line. Like I mentioned, I showered up and headed home just for the day afterwards. Boy, was that exhausting! I really couldn’t help but make use of the grill while I was there. Any guesses? 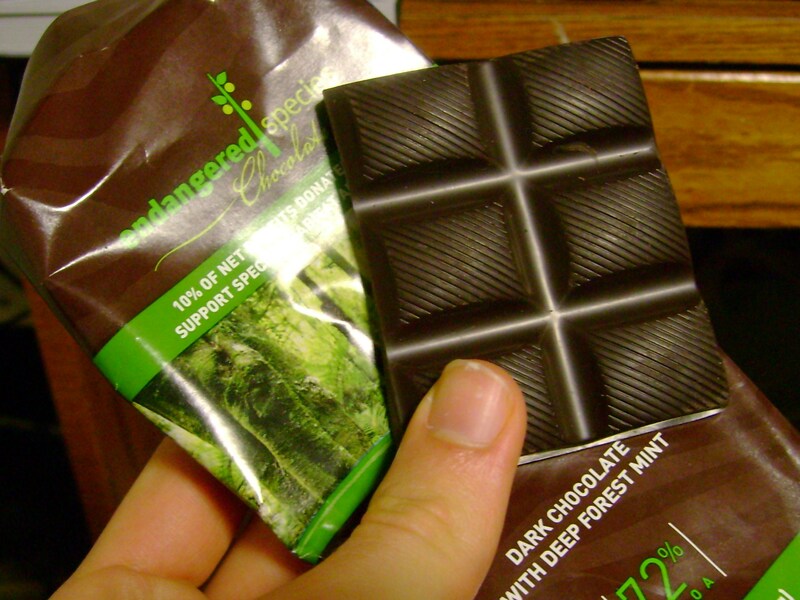 It’s chocolatey, caloric, delicious, and contains no animal byproducts! I think I pretty much gave it away at that 😉 Expect a recipe to come(and to see much more because I took near the whole pan back with me). 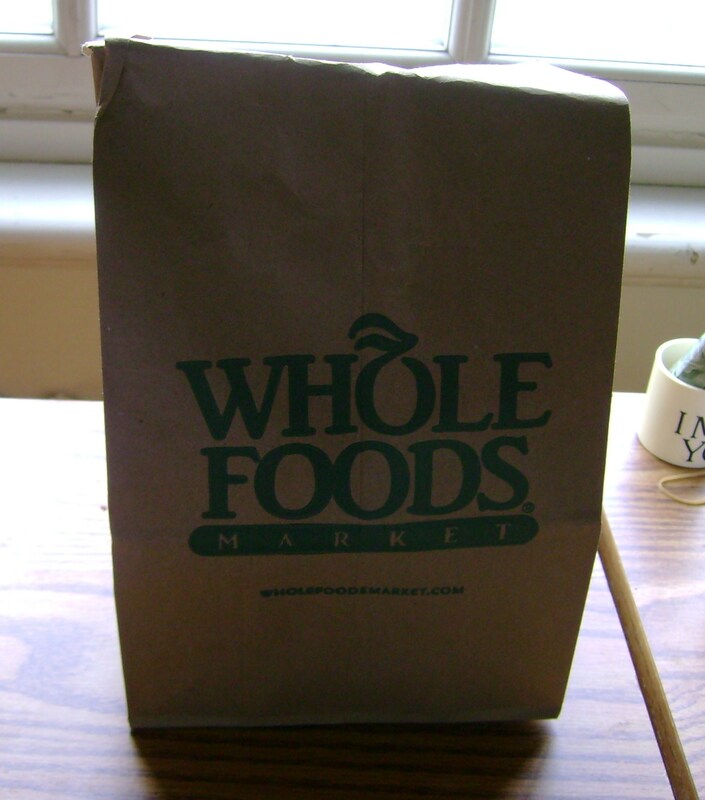 On the way back we stopped at Whole Foods where I was damn-near famished. I guess that was the post-run hunger hitting me. 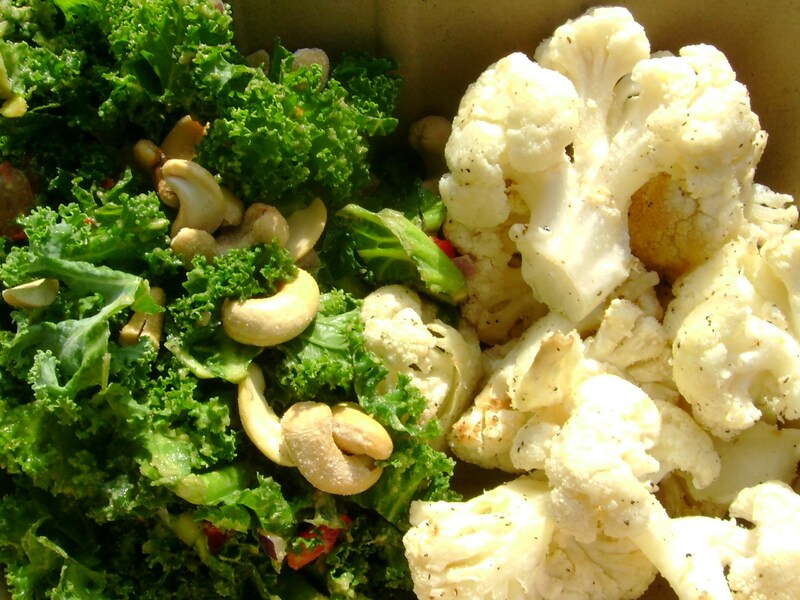 I took advantage of the salad bar and got Parmesan cauliflower and avocado rubbed kale salad with salted cashews. Yum! These are my two favorite things that Whole Foods makes that, try as I might, they just do it better. The highlight of the day was getting new shoes!! 10 months and 1 day later, it was about time. The funny thing is is that these are the exact model as my old ones. I knew I liked the brand, and when I saw that these were $30 off, how could I pass them up? 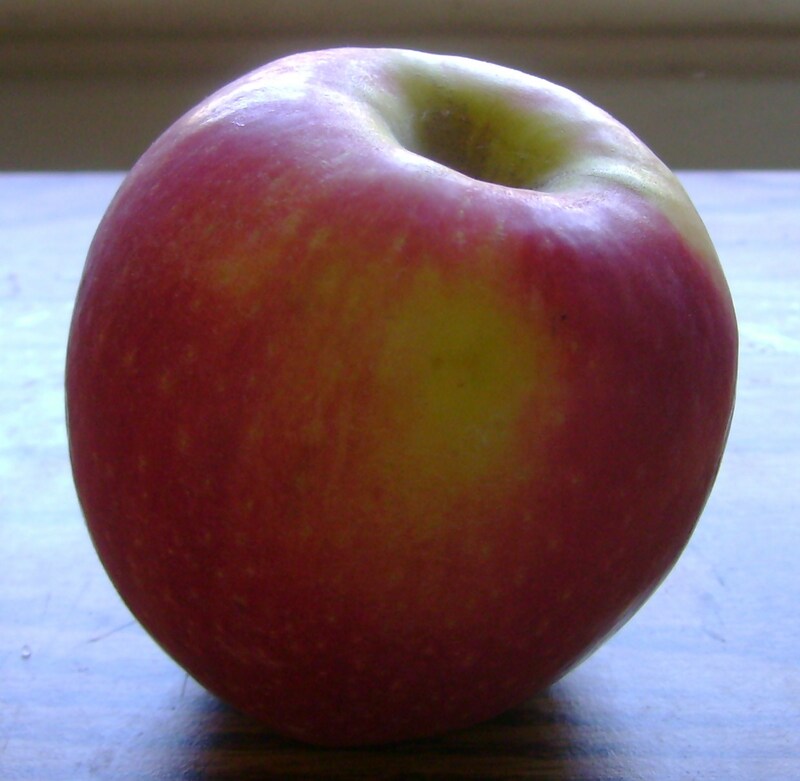 Getting back to my dorm, I snacked on an apple unpacking. The shuffling around is always the worst part; but at least I don’t have to do laundry tomorrow 😀 Happy Monday to me. 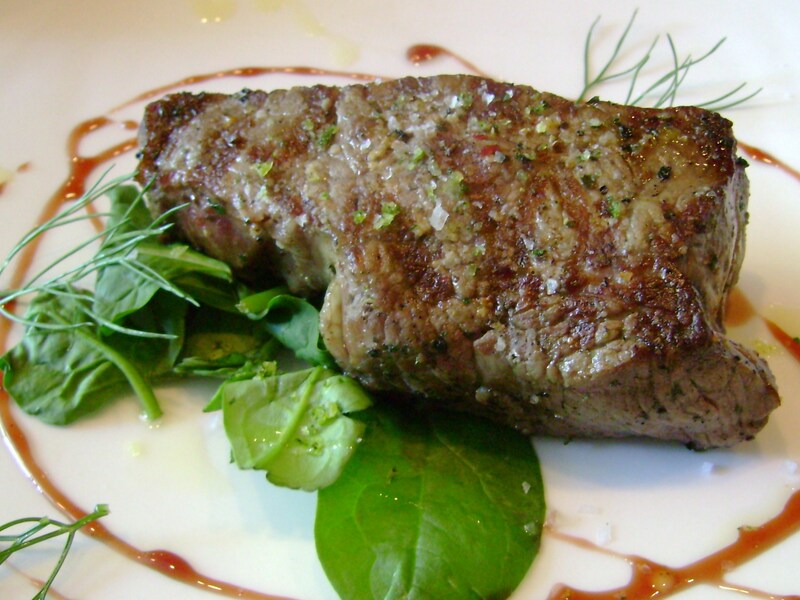 I could not wait for everything to be away and to have dinner. 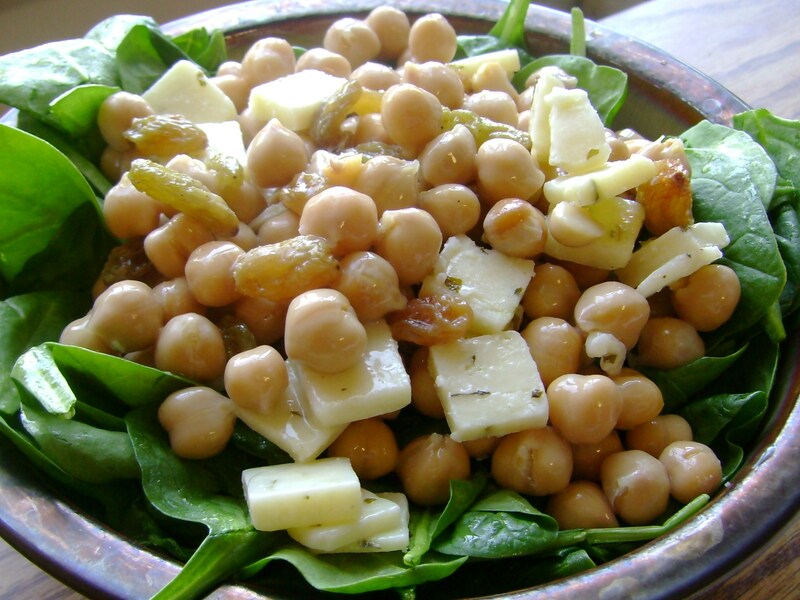 I just needed something easy and raw, so I had a salad with chickpeas, Navitas Naturals Mulberries, Next Generation Dairy organic raw & probiotic parsley cheddar, and salad with Foods Alive hemp oil sweet & sassy dressing. The hardest part of this was knowing that I was going to eat it and taking the cheese out to breath an hour beforehand. Do you get any magazine subscriptions? What are they and any horror stories? I get Food Network and Rachael Ray. I bought them both after Christmas with gift money because it’s much cheaper to get them by mail than at CVS, which I would have done anyway. I love my food magazines, but they’ve both tried to repeatedly bill me, and I just got a bill in the mail for Rachael Ray to charge me again. I’m sure I’m not the only one with troublesome subscription issues given the nature of the industry. Hello, hello! I feel like this weekend totally flew past me between the auction Friday night to Avery’s birthday party to now being back in my dorm room and attending classes again with little to no transition in between. When the flow goes, go with it! As any Rhode Islander knows, there were massive floodings earlier in the month from a huge rainstorm that hit us. Businesses and houses were destroyed, and Whole Foods was holding an ice cream social to help raise money for those families. 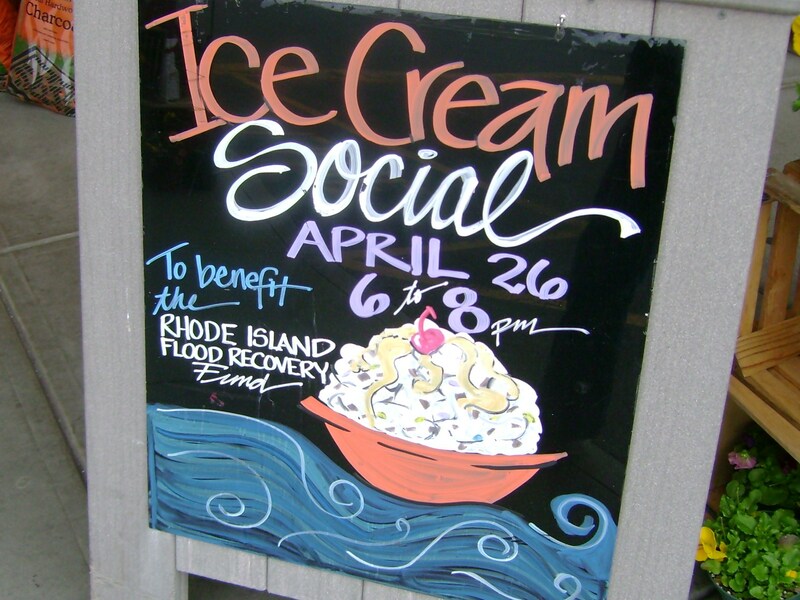 I can definitely get into ice cream for dinner for charity. I was hoping they’d break out the fun and funky pints for this, but they just had 365 vanilla and chocolate I got vanilla ice cream with organic chocolate sauce, 365 whipped cream, and a natural maraschino cherry. 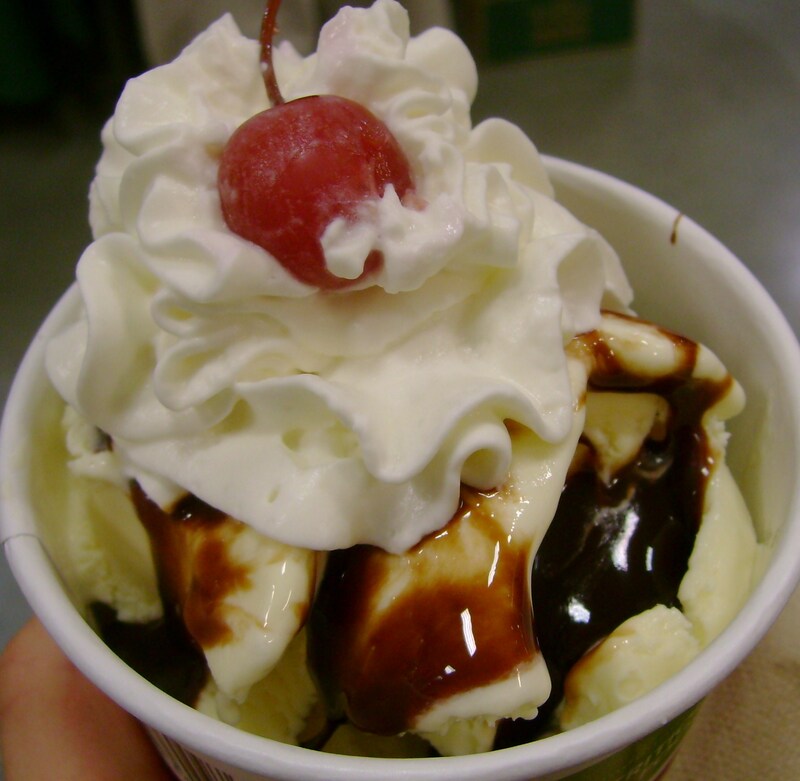 Sundaes always taste better when someone else makes them for you with a heavy hand. 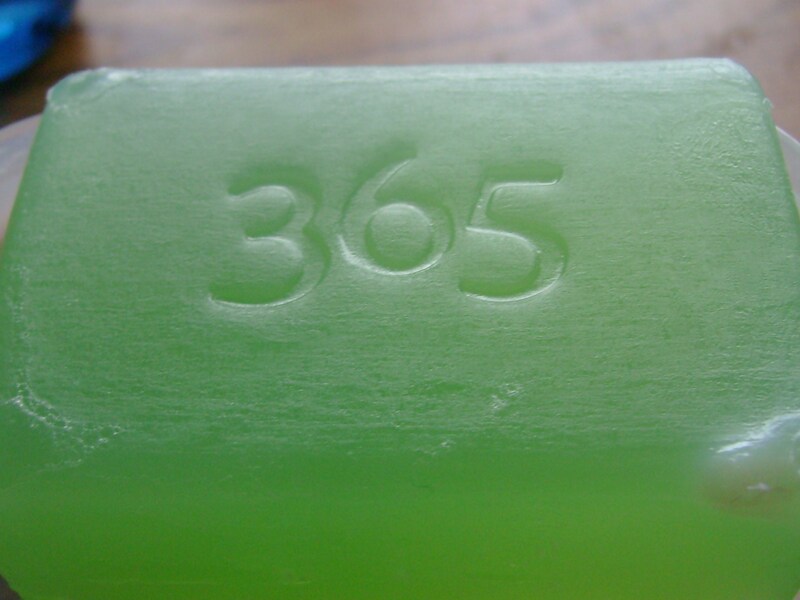 The 365 vanilla is OK, but I’ve definitely branched out from dairy-based ice cream and have had better. Other fun finds(but not purchases) at Whole Foods were the new So Delicious flavors in stock and Daiya vegan cheese! While working on some homework not-so-hard, I had the snack of champions: an apple, mint dark chocolate, and decaf coffee. Could I have had a little more sugar last night? It was all for a good cause–let’s keep that in mind. Last Summer I managed to switch from caffeine to decaf coffee; this year it’s been about weening off the stuff completely from the acidity, but I do have about a cup a day, which is probably an ideal balance of antioxidants and acidity. I don’t think I could/would give it up completely. I couldn’t deal with more sugar before bed so I went the spicy route with The Heat Is On peanut butter and a savory Omega-3 egg. It might be hard to believe it through my sweet tooth and all, but I definitely could not go a day without a good deal of savoriness. Sometimes, my garlic tooth is just as big. Back to classes and rain meant back to runs first thing, so I woke up at 6:30 to squeeze an 8-miler in before class. Normally, dairy and protein wouldn’t work for me before a run. But it was all I was craving. 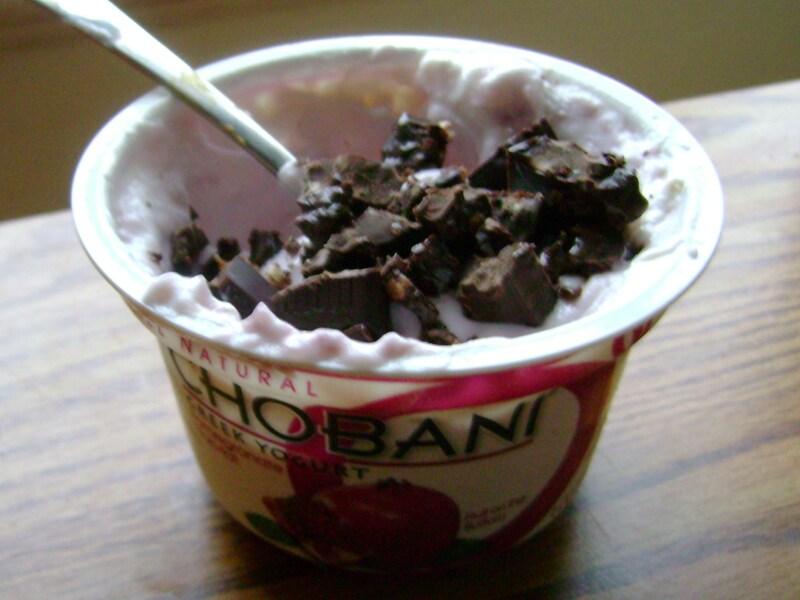 And since I was going to run anyway, I thought why not have the damn pomegranate Chobani with Alter Eco dark chocolate quinoa. Finally, for breakfast I was craving craisins. I just wish there was a bar called that so I could have known what to eat so much easier. 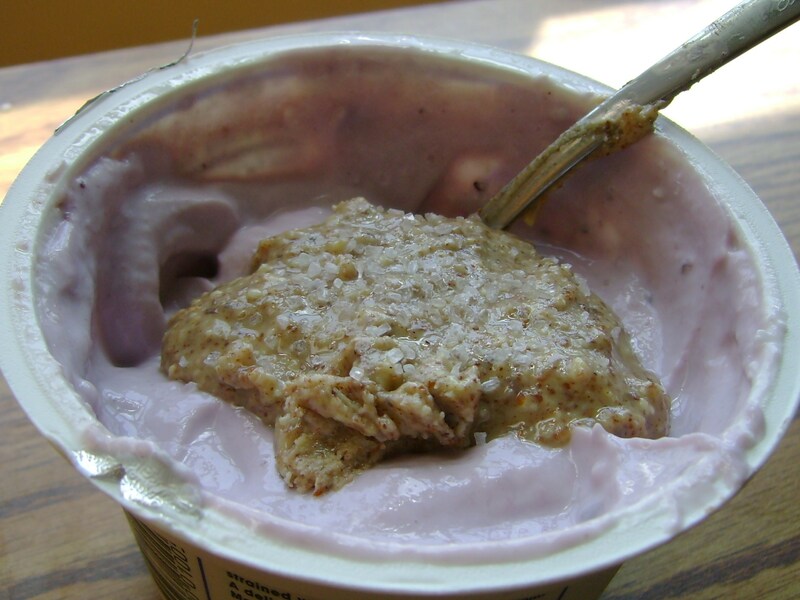 I mixed Crofter’s Organic Europe jam in a plain chobani and topped with Tierra Farm‘s organic dried cranberries–holy yum were these soft and squishy! 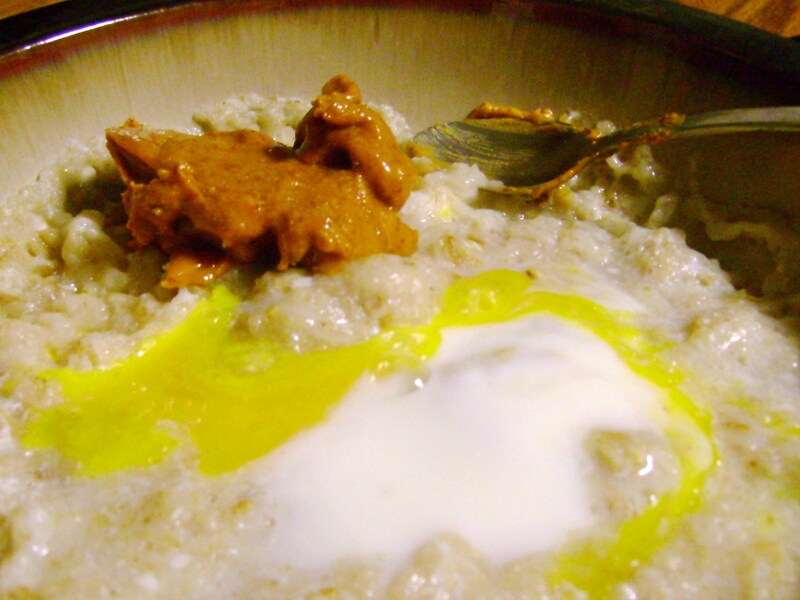 On the side I had oatmeal with another egg and some Teddie’s pb sweetened up a tad. In class I got bored and calculated that I ate around 50g of protein and all before lunch! Sure, you could just take 2 scoops of a powder and call it at that. 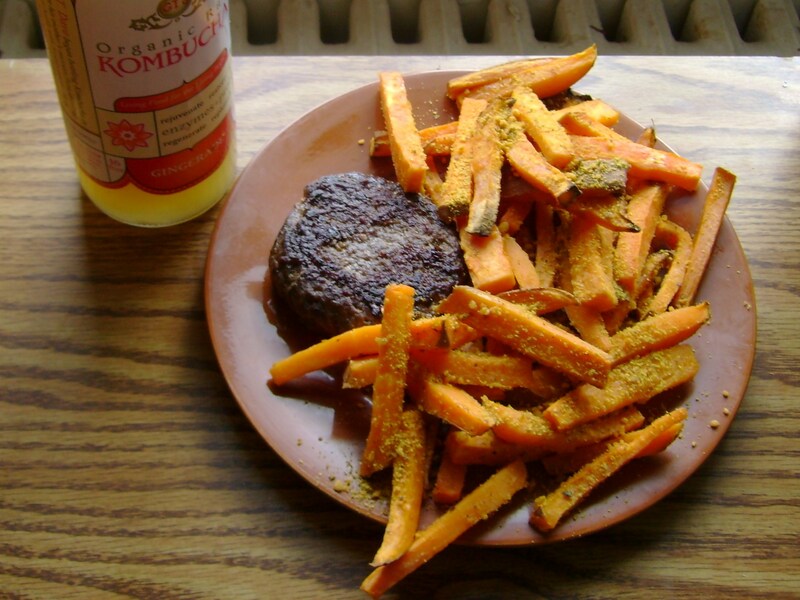 But I love getting so much nourishment from real food. Do you have any cooking goals? 2 of the things this weekend inspired me to do are 1) use my food processor to make more complex and delicious raw foods and 2) learn to fry tofu. An ironic pairing, no? Well, if things go my way today, I’ll be incorporating one of those into dinner… Is there anything you want to learn to do in the kitchen? Whole Foods doesn’t get the name “Whole Paycheck” from no where; You can easily go in and find an organic goat’s milk cheese for $30 a pound or organic marinated pork for $15 a pound. But where can’t you find pricey items like that? 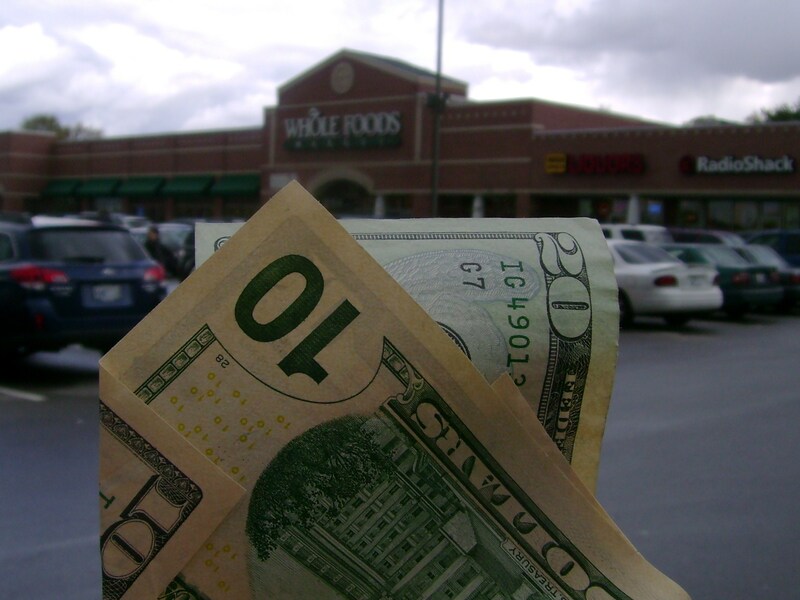 The truth is that Whole Foods can be equally as thrifty as expensive if you play your cards right. This sounds like exactly the opposite of what you’re supposed to do at a super market; the outside is where all the fresh produce is. Well, that tends to be Whole Foods downfall. 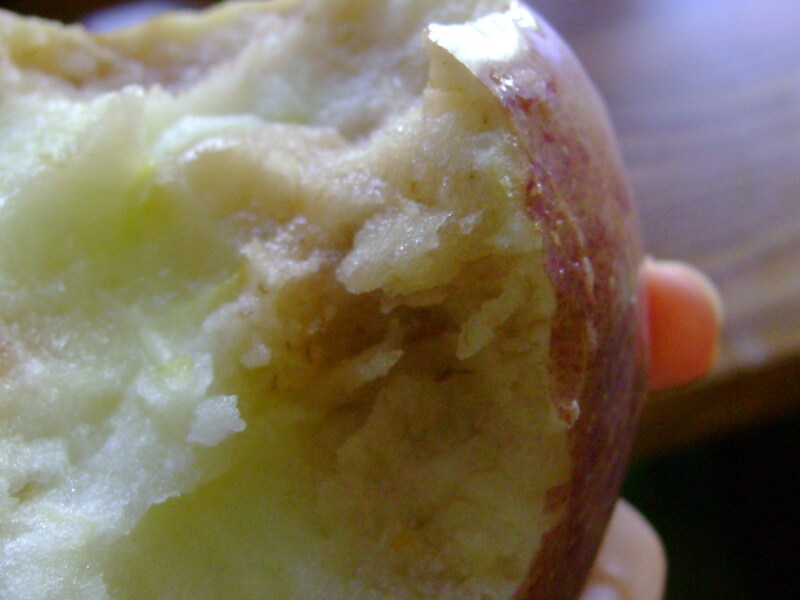 Their conventional and organic produce are often more expensive than at other stores. Leave these be here, and instead look elsewhere for produce. 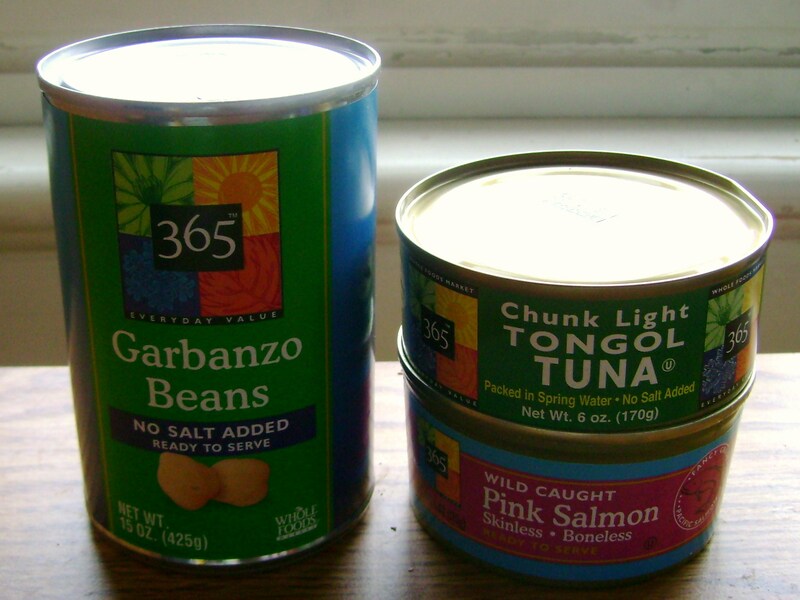 Canned beans and meat are pantry staples and always taste fresh from Whole Foods. 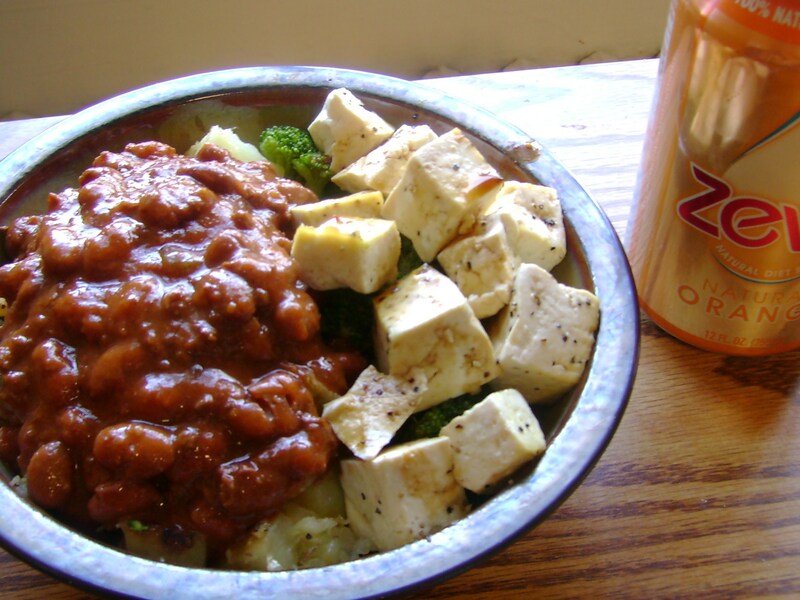 For something even cheaper, get a bag of your favorite beans dried and make them yourself. 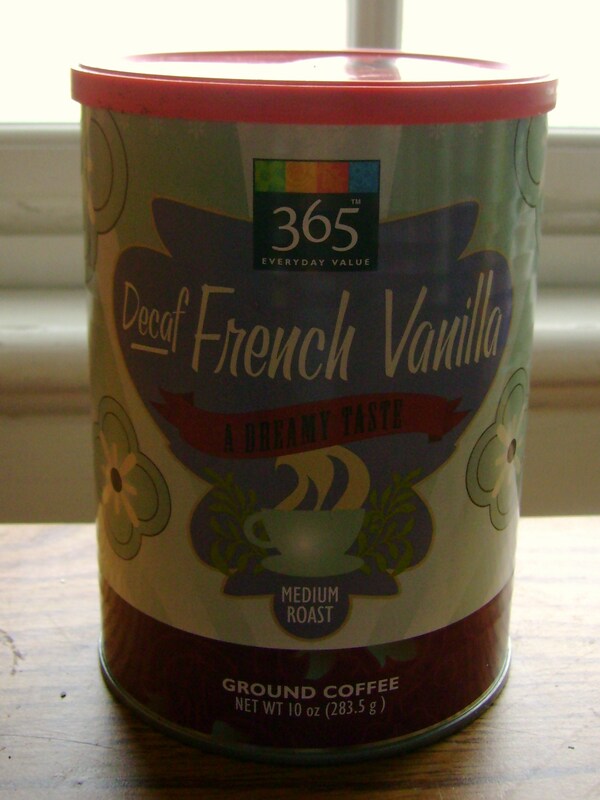 Whole Foods is one of the few people to sell decaf coffee that’s also flavored. And it’s priced reasonably, too! Beyond that, it just tastes good and not like the muddy other store brands I’ve had. Wake up 365 days a year to Whole Foods. 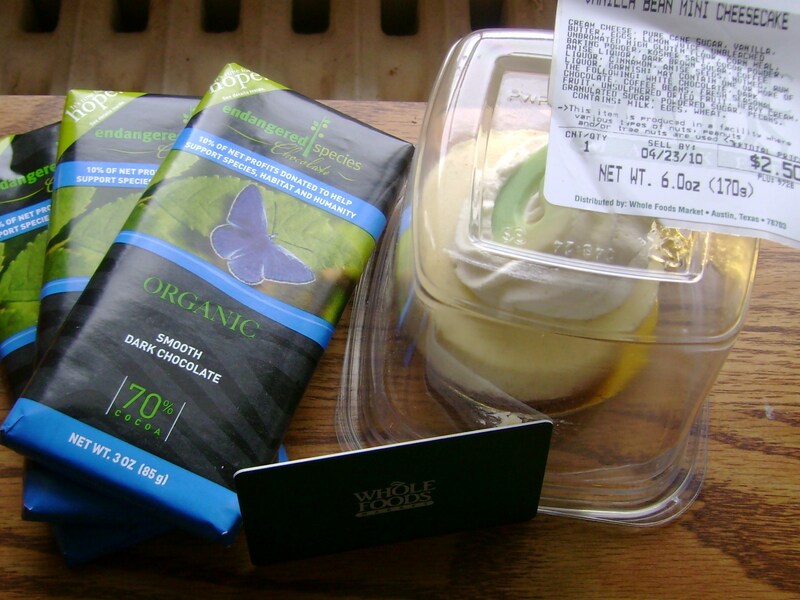 Beyond food, I also use some Whole Foods products in other places in life. Their soap is by far the cheapest all-natural brand around. The same can be said about a lot of their 365 personal care items. If you’re picky about your body care, it may not be premium. On the other hand, if you’re just a bachelor like me, it’s as good as any. If you’ve never picked up a Whole Deal flier, you’ve been missing out. Not only does it have fun recipes and ideas, but it’s filled with coupons. And if you match these with store sales, the savings can be unreal. I paired a Steaz beverage sale(2 for $5) with a buy 1 get 1 coupon to get 8 Steaz for 2.50! That otherwise would have cost $9+. 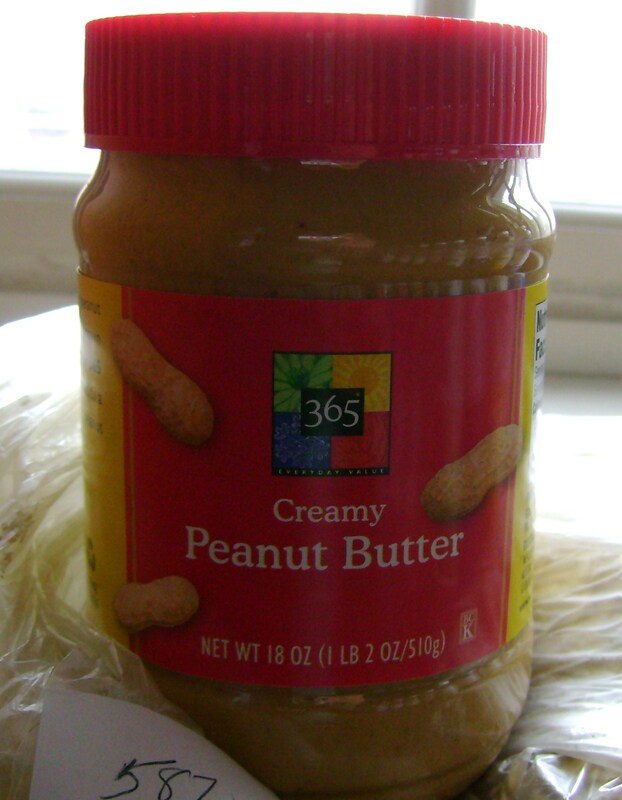 My favoite current coupon is $1 off their 365 peanut butter, which brings the price down to just $1 for a 16oz jar. This is by far one of the best all natural peanut butters I’ve had, and that price is better than so many else. I would say pick up a jar or 5 while they’re still so cheap! The bulk section is one of my favorites. 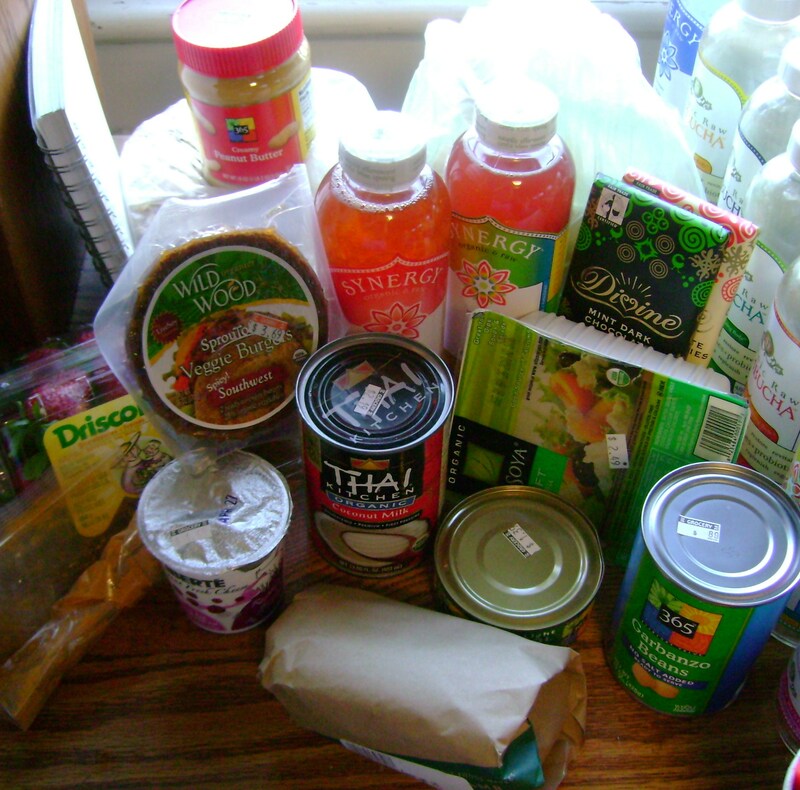 It’s double beneficial: Usually, whatever you can get at the bulk bins are cheaper than buying them otherwise. 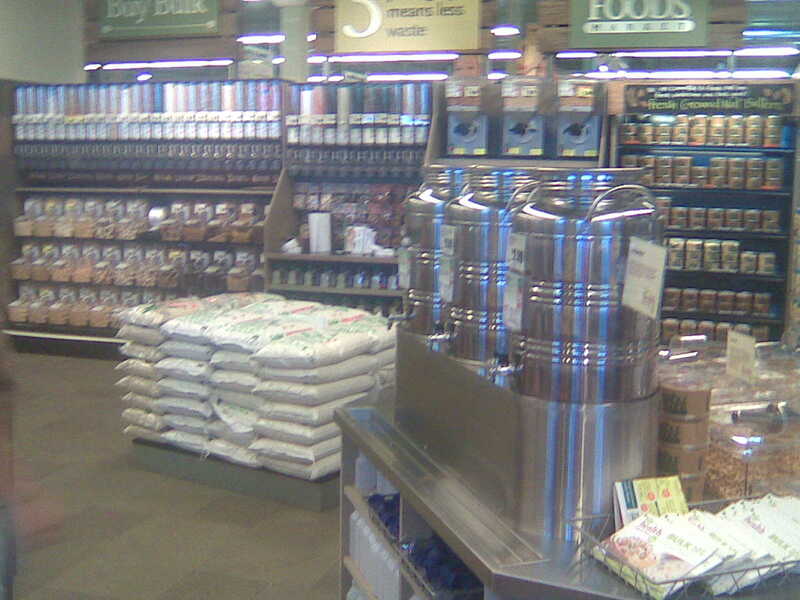 I get my organic oatmeal for $1.50 a pound, or 99 cents if it’s on sale. It also helps that you can buy just the right amount at the bulk bins, too. When I’m making my raw vegan brownies or any other recipe with dried fruits and nuts, I use the bulk bins to buy just what I need and not have extra. Averie has brought up–and rightly so–that these can be breeding grounds for God-knows-what and you can never know whose hands have used them. Still, I put trust in my bulk bins and enjoy so much from them. 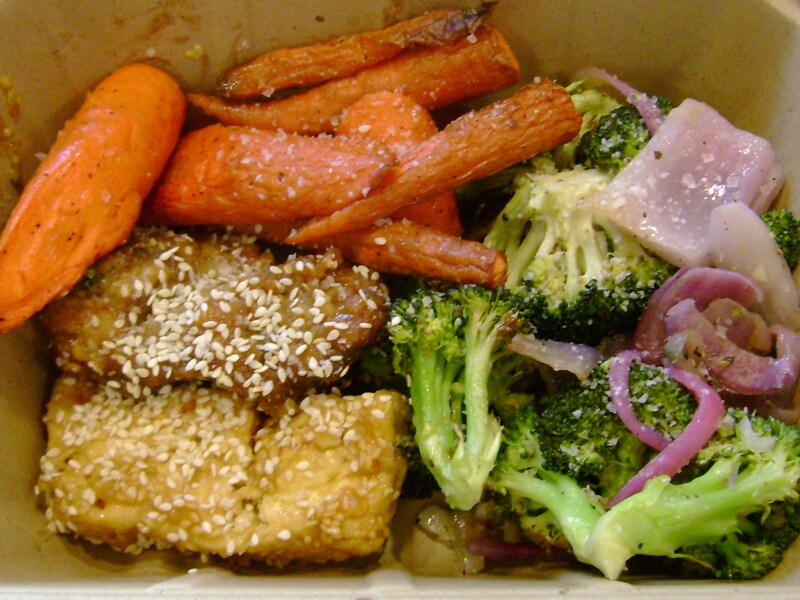 Lastly, one of my(and I suspect others’) favorite past times is eating at the amazing Whole Foods salad bars. These can also be a nightmare for cost-conscious people. I would say first and foremost to just enjoy it like a night out; how often do you really get to do this? But there are ways to save, too. Look where and what might be cheaper. 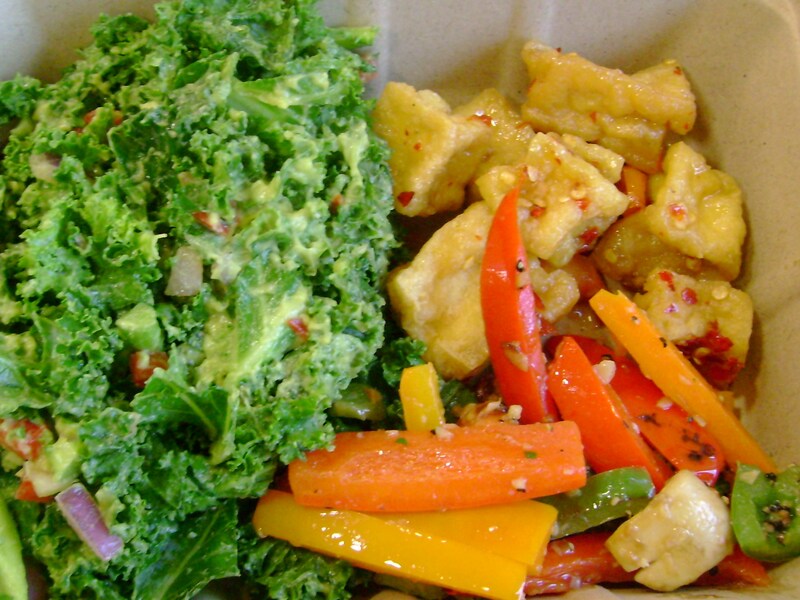 Is the $7.99 a pound from the salad bar really the best option? 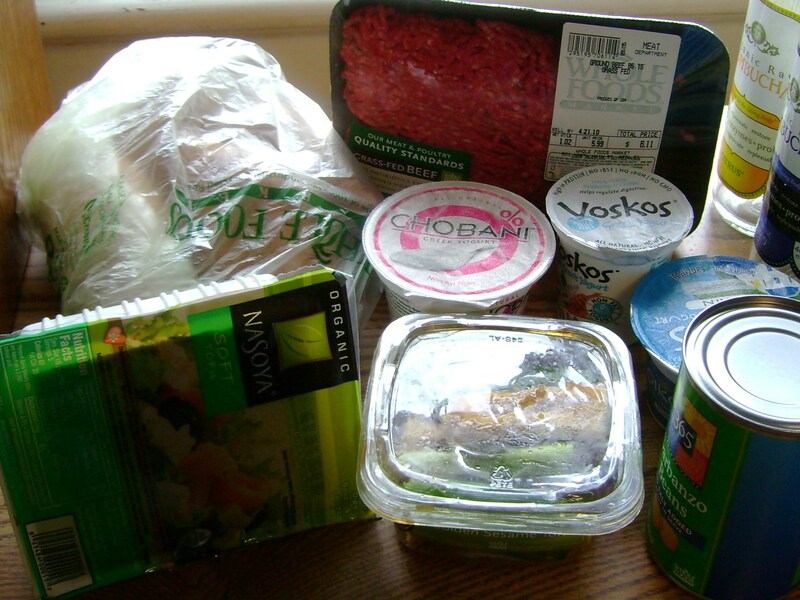 It might be cheaper to buy a protein from the prepared foods(not to be confused with the salad bar) or the refrigerated section. 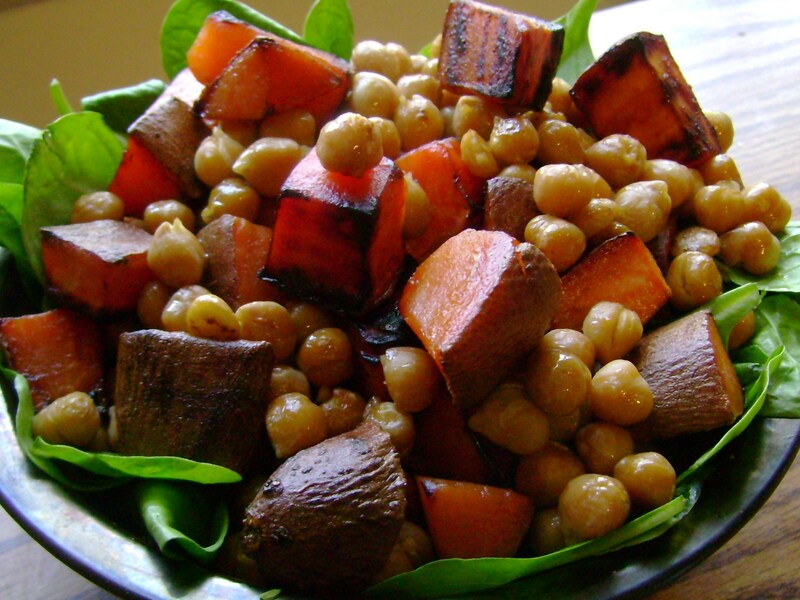 And if you’re just going to be getting plain veggies, get them from the produce section and use the in-store microwave to cook them. 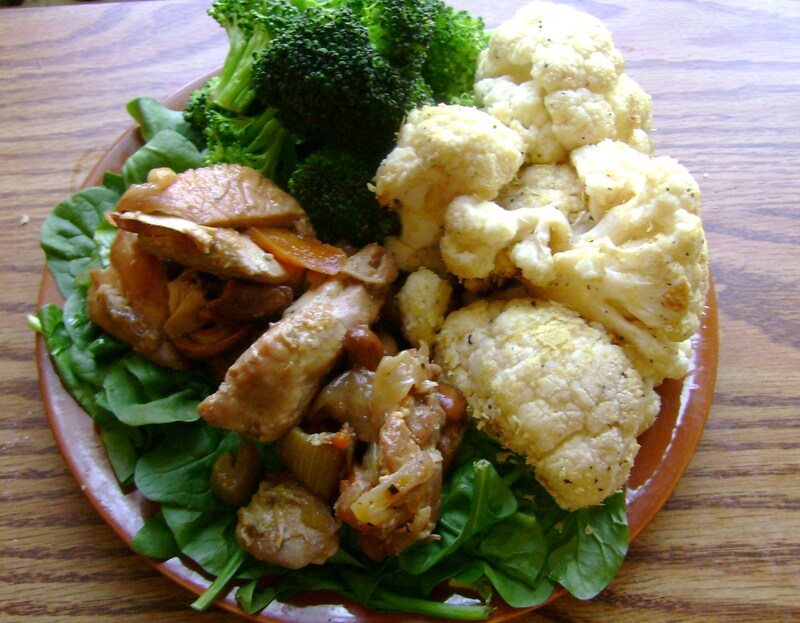 Just because you’re eating at Whole Foods doesn’t mean you need to eat from the salad bar; save that for fun and unique foods that you wouldn’t be able to make yourself or get any cheaper. I can’t tell whether I’m happy or sad Sunday night has come already. Today, I was lucky enough to have done most of my work and not have anything planned. The next day that’ll be like this is… farther off than I know. So instead of trying to do more, I just took care of everything domestic, starting at the gym. 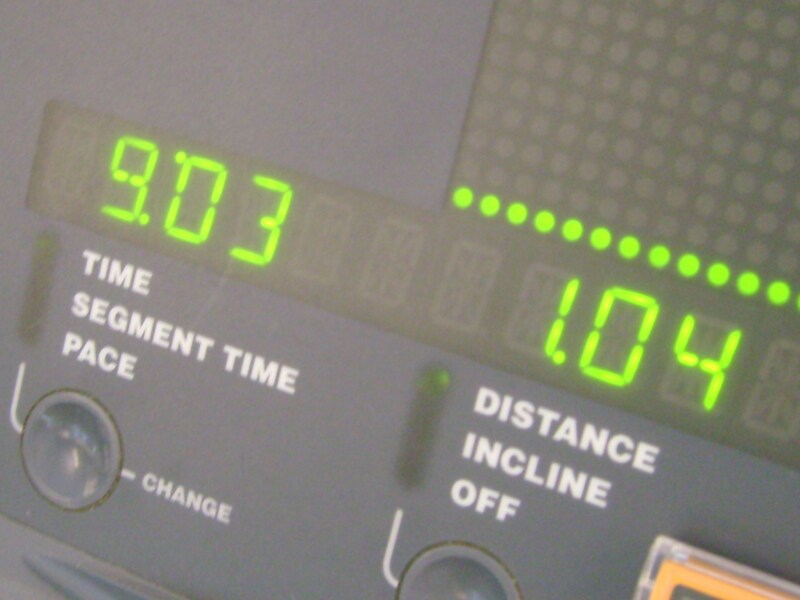 I ran a rather speedy 10 miles while watching the first episode of the new Dr. Who season on my ipod(!!). So excited that’s back, and even more excited that I was able to multi-task like that because otherwise those miles would have felt looooong. 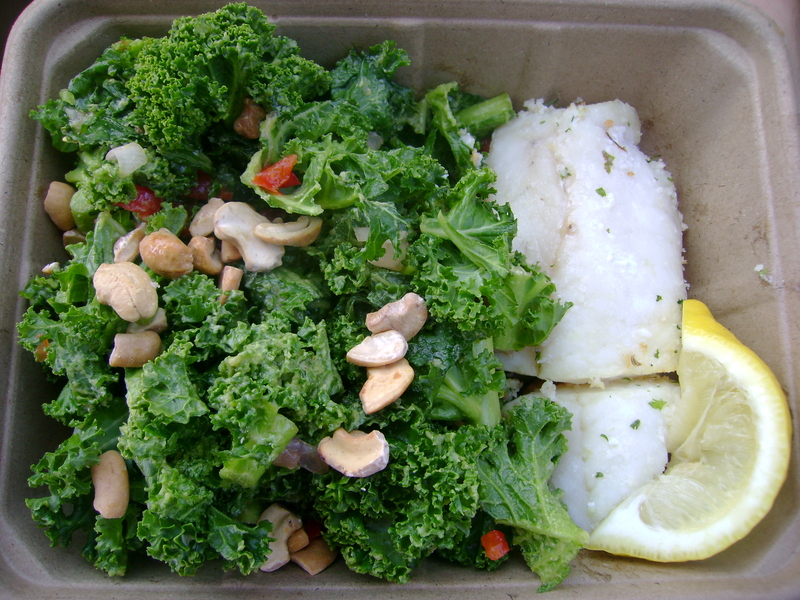 Lunch was definitely not a quick post-workout meal, but it was well worth the time put around it. 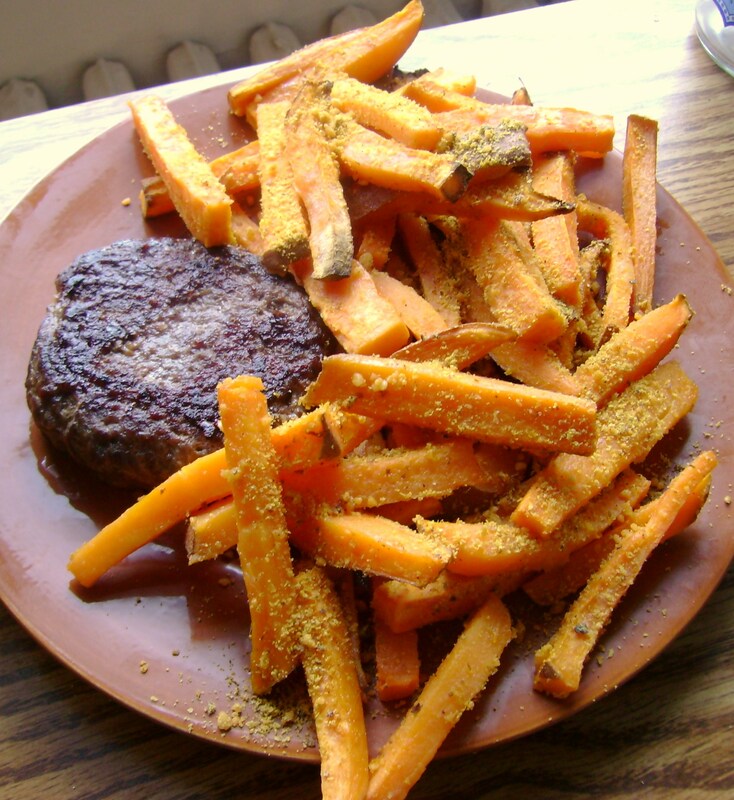 I threw sweet potato fries as soon as I got back, and after 30 minutes they weren’t crispy but definitely edible. I tossed those with some cayenne parma for serious flavor. The burger was meh. It was a lot like the last, in that a) I undercooked it and b) the meat was of questionable quality/age. Getting sick threw off my “mojo” but now I’m happy those burgers from last week are all gone. 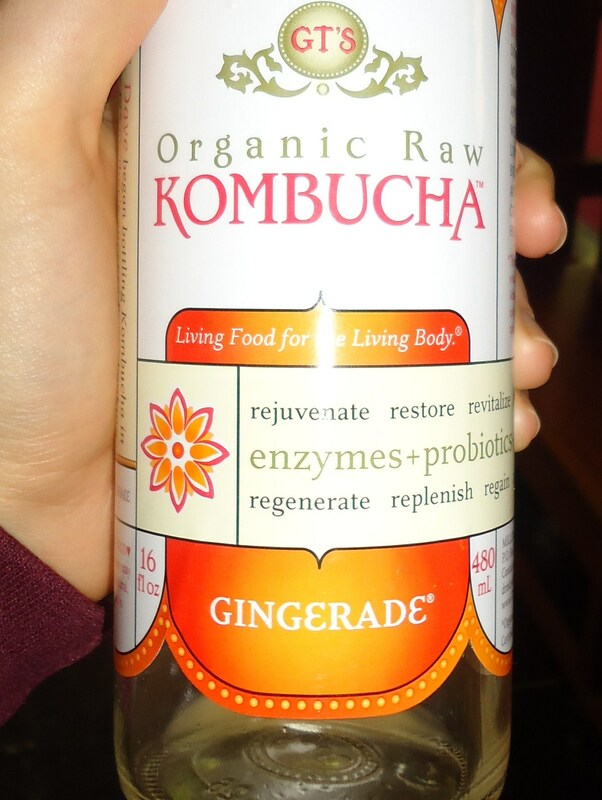 And my gingerade kombucha was tangy, but not fizzy; what gives? I hope the probiotes were still alive… Not being able to keep sea monkeys I can deal with, but killing kombucha and I’d really feel shame. I walked the 1+ mile to Whole Foods in the mediocre weather because I’m not sure when/if I’ll have time in the coming days. If you’re wondering “Why the money?”, it’s because I’m following suit with Holly on Project Cleanout. Not only do I have more than enough lying around to eat, but I’ll literally have to clean out the dorm in a month, so it’d be a lot easier if most of it wasn’t here. I gave myself a $30 limit to buy whole foods I’ll eat over the week. But let me stress: I’m not perfect. If you count these in, I definitely went over budget. “What’s the deal, Evan?” Well, the deal is that these were a deal. I knew I’d be buying my favorite chocolate bar again some time some day, so I bought 3 while they’re on sale to save $3. I’m also putting them out of reach so that I won’t touch them until I eat more of the other chocolate bars I’ve started or won’t replace. And the vanilla bean cheesecake was 1/2 off, so I couldn’t say no. All of these little “splurges” that aren’t real groceries I buy with a gift card I was given by my neighbors, and I save the grocery money for fresh foods. 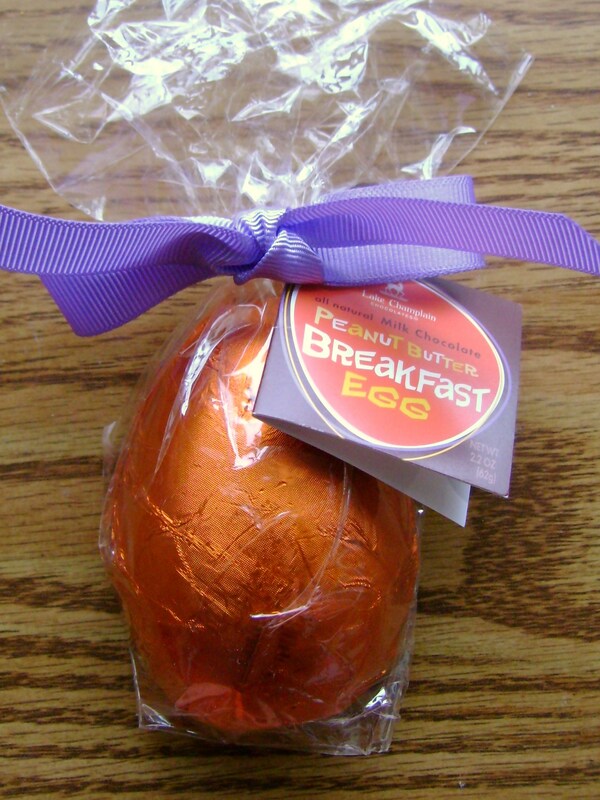 I’d like to say I snacked on a healthy egg, but instead I snacked on a peanut butter egg from my Easter basket. This was a Lake Champlain creation with milk chocolate, white chocolate(somewhere), malt, peanut butter, and peanuts. If I realized before it had wheat, I probably would have passed it up. Honestly, it was just alright and not really worth risking setting off my gluten intolerance. I loved how much of it was peanut butter; it was like eating straight out of the jar. 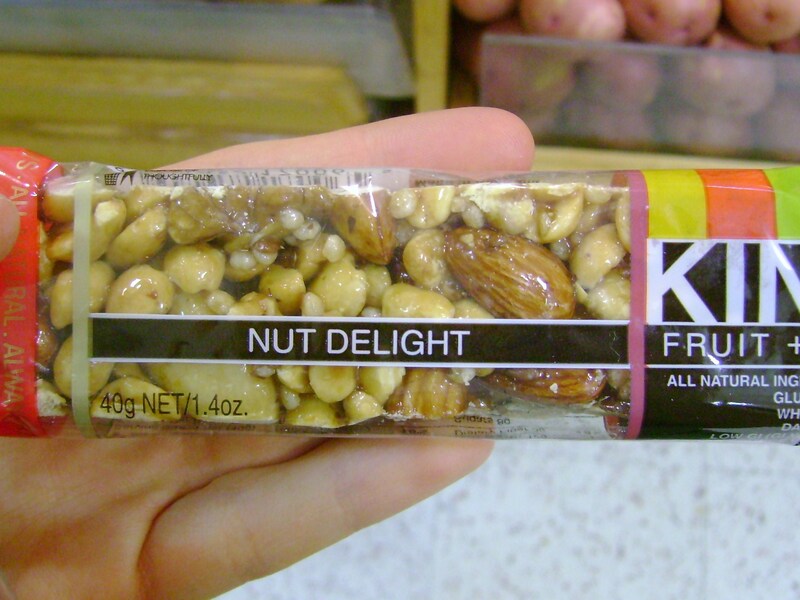 But it also had a pretty “cheap” taste to it even if it was all-natural. Clearly, I’m not a fan. But I would have felt amiss not to have a giant egg this time of year. 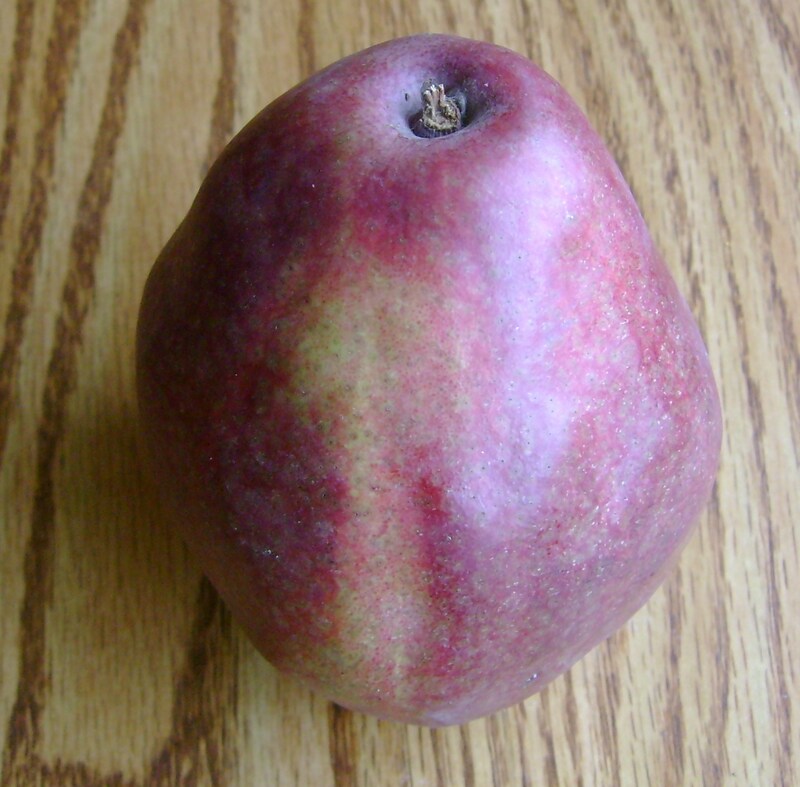 I also snacked on the largest red anjou pear I’ve seen from the dining hall while dinner cooked, and did chores around the place. My new “saving grace” is baking soft tofu for 90 minutes instead of pressing it first and still getting the same texture. Pressing’s great, but it uses up too much paper towels, and I much prefer this no-fuss method. For dinner, I made a simple salad with spinach(!! 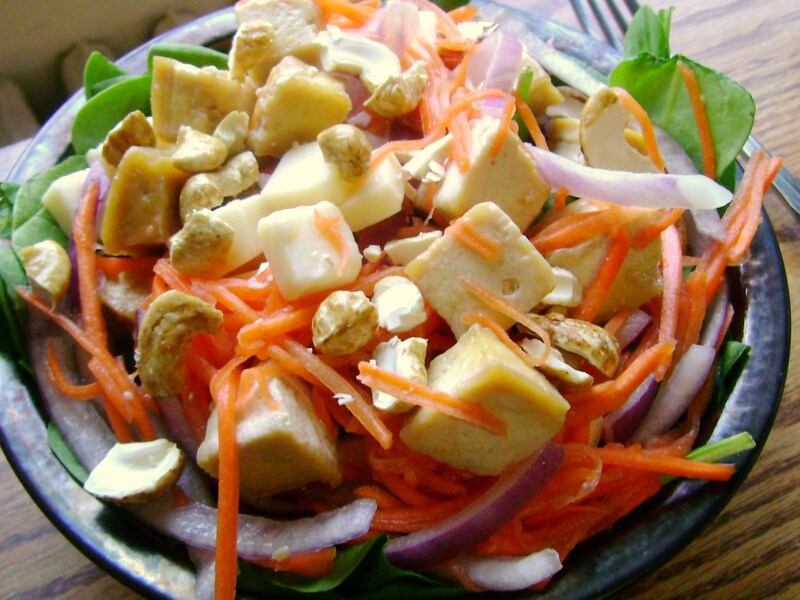 ), maple baked tofu, Next Generation organic raw cheddar, carrot shreds, red onion, Tierra Farm’s maple glazed nuts, and watered down maple syrup for dressing. Perhaps it’s being a blogger, but I’ve gone for not caring for any greens to seriously preferring spinach over any other, so I’m always happy when the dining hall has that. Besides that, I loved how easy and no-fuss this meal was 🙂 What’s your favorite no-fuss meal? I could always use suggestions for that. Sounds domestic to me 🙂 G’night. I’ve had that Taylor Swift song stuc in my head for the longest time now. At least today it was pretty applicable! I was in such a bad mood this morning, but once the day got going things turned for the better. I even got to visit 3 of my favorite places 😀 Any guesses where those might be? 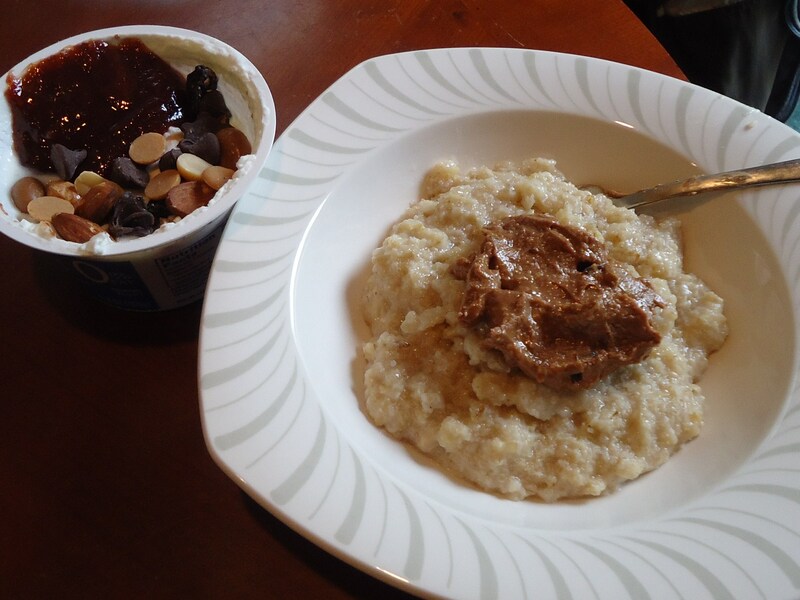 This mornings breakfast was not enough to make me happy; I followed up a big bowl of oatmeal with peanut btuter with a slightly smaller bowl of oats with peanut butter. At least I know what I like? 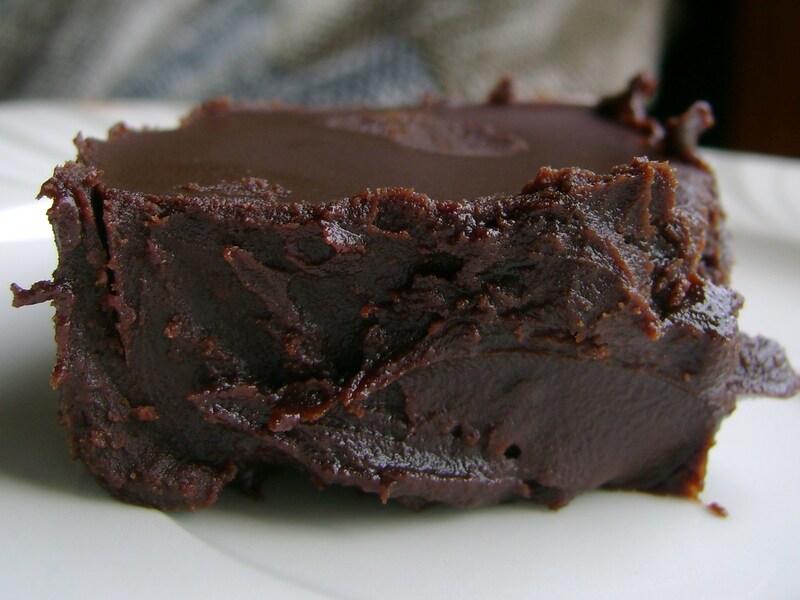 The nut butter was 365 creamy mixed with Madhava’s vanilla agave; I swear this made it taste like Reese’s PB! Sooooo good. 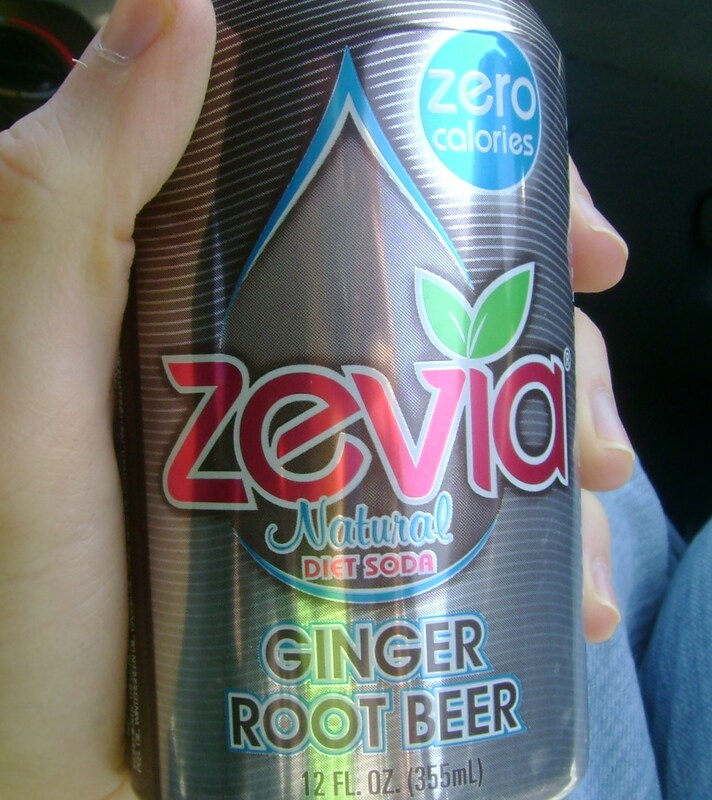 As if the morning weren’t off enough, I decided to drink a root beer Zevia at 11am before running. Who am I?! 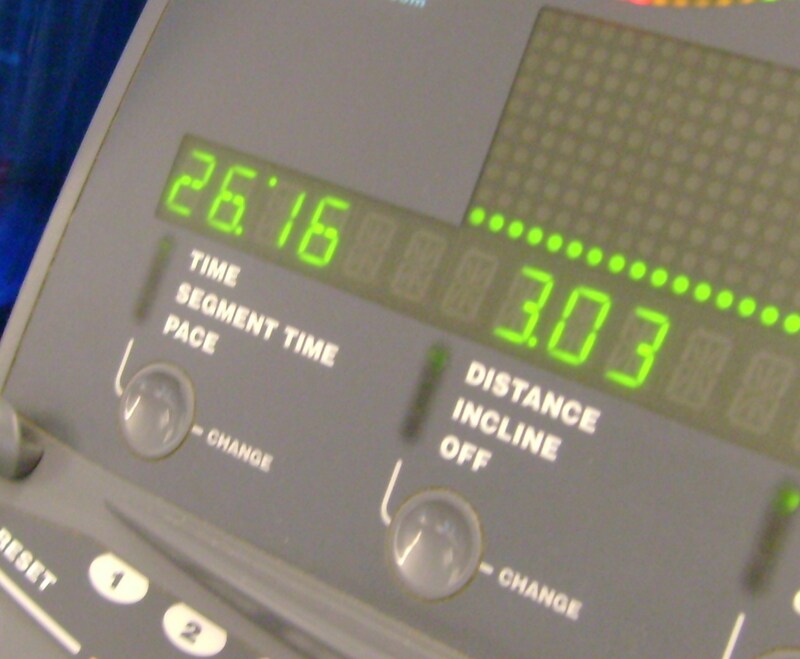 I didn’t feel like running; but I didn’t feel like not running. 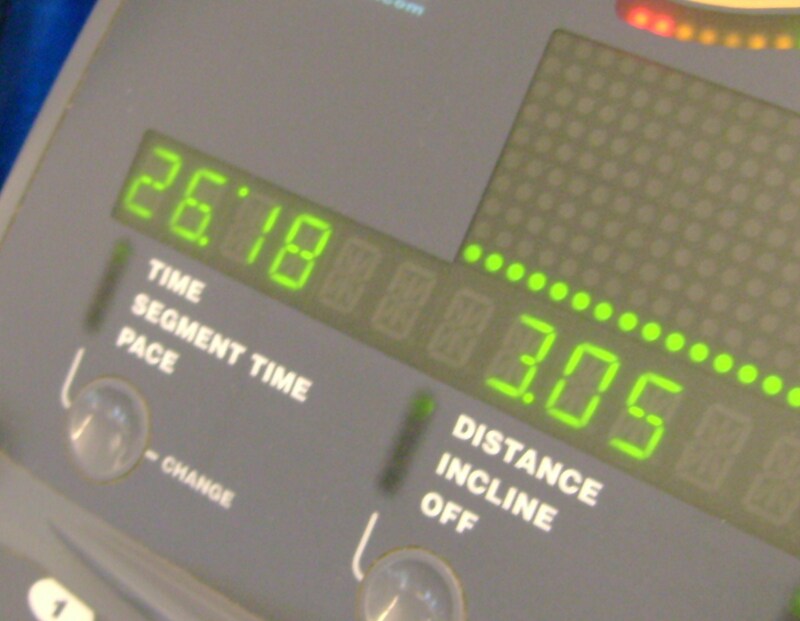 At that, I went to the gym where I could take it easy on the treadmill watching Mr. Deeds. 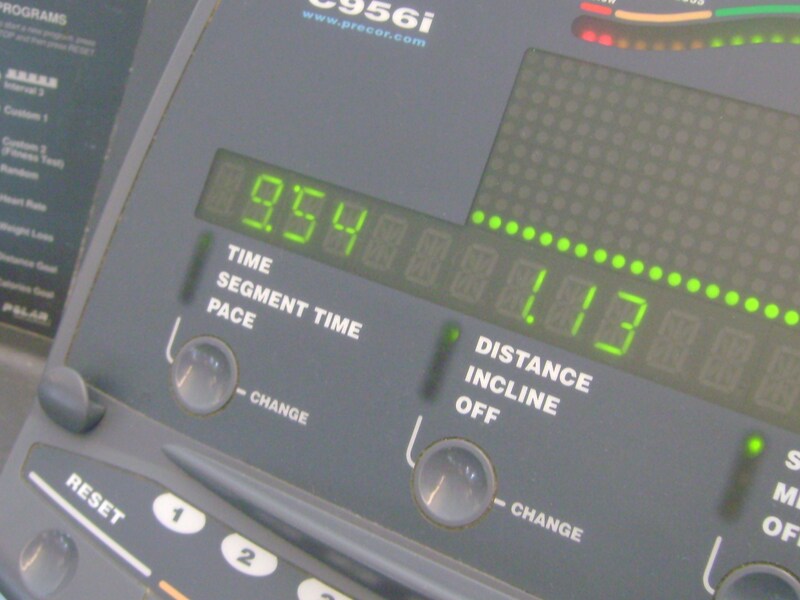 I did 8 miles, and they didn’t go slow or fast; they just sort of “went” and I was tuned out, listening to my iPod. At some point, I had a grand idea on how to change the day around. After I finished running 8 miles in 69:54, I ran another 3.27 miles outside in around 27 minutes and ended at one of my favorite places. 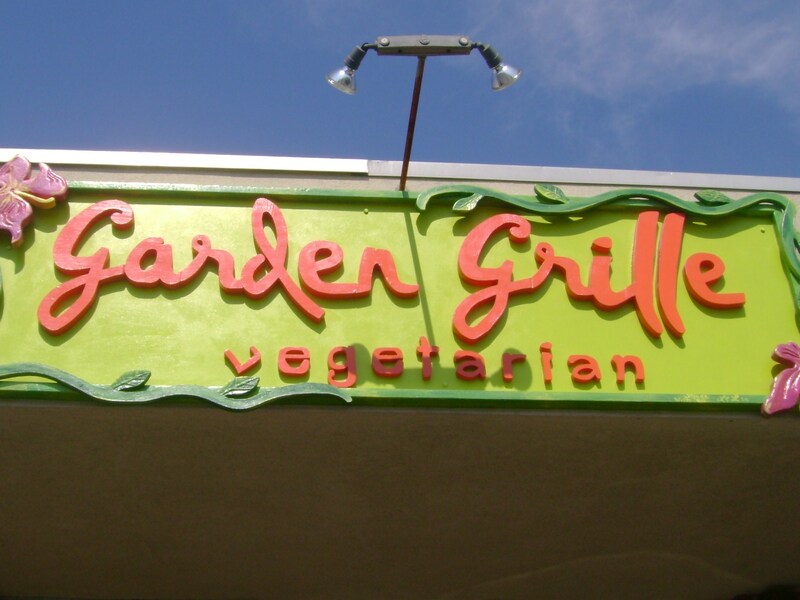 Love Garden Grille! 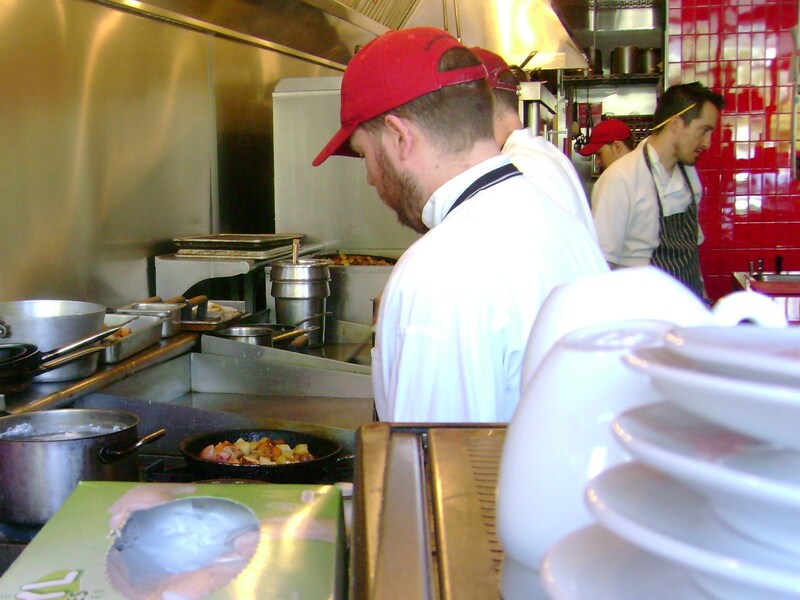 Especially their brunch menu, which is only available on Sundays. Therefore, I’d have been a fool not to go. Also, my dad was driving down to Providence for the afternoon, and he was easy to persuade to eat here, too; we all just love their food! I also love how flexible they let me be ordering. 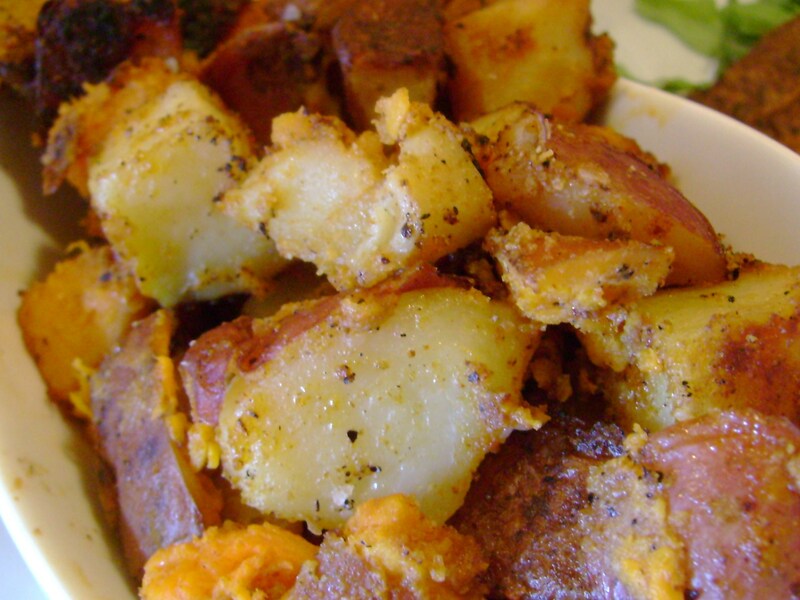 My favorite thing by far of theirs is the home fries, which comes as a side to every dish. 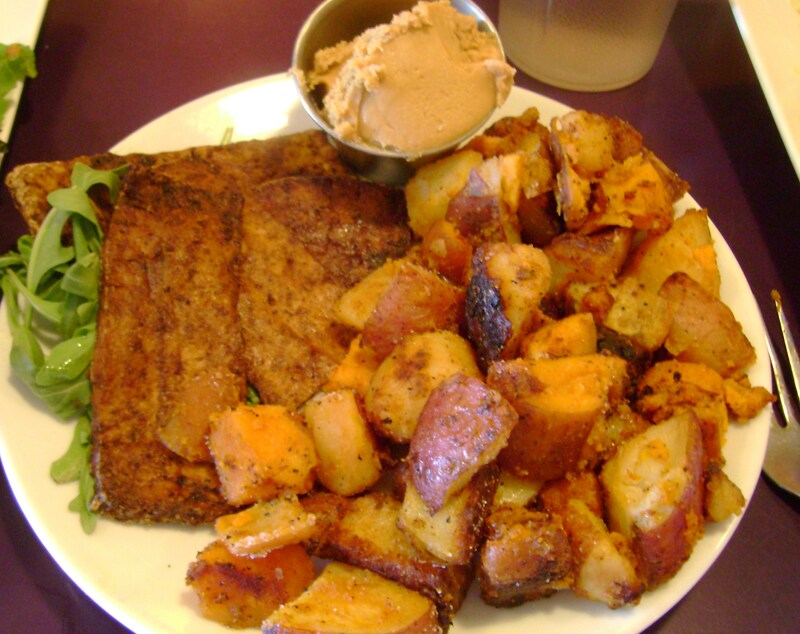 And while–to their credit–all their dishes sound really good, I’m a man of simple tastes; I’m plenty happy with just their home fries, so I ordered a side of them and a side of their homemade tofu bacon and asked for a little dish of peanut butter. Holy yum! 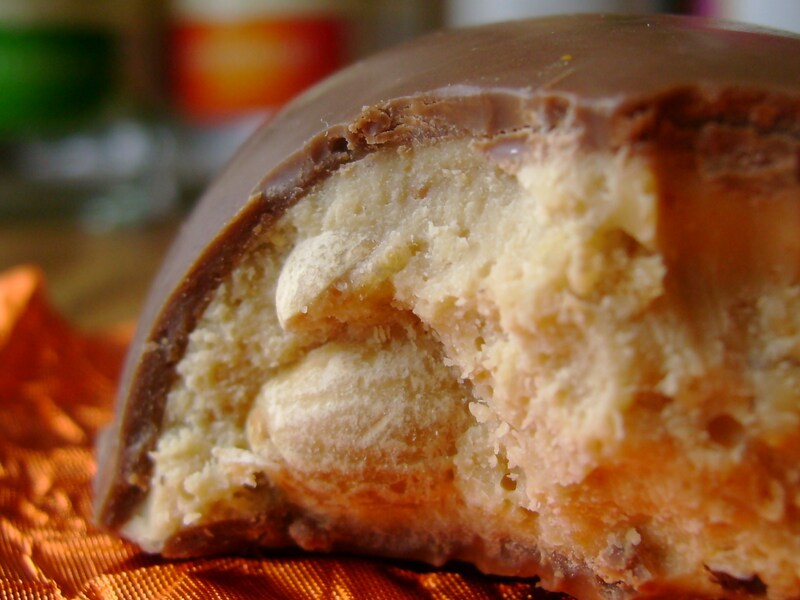 This is an amazing flavor combination with the rich flavors of peanut butter and hash fat. It’s an odd combination, but I get it every time. How many more do you think before I get a menu item named after me? The Evan Hash. After that amazing lunch, we decided to do something a little more fun for the day. 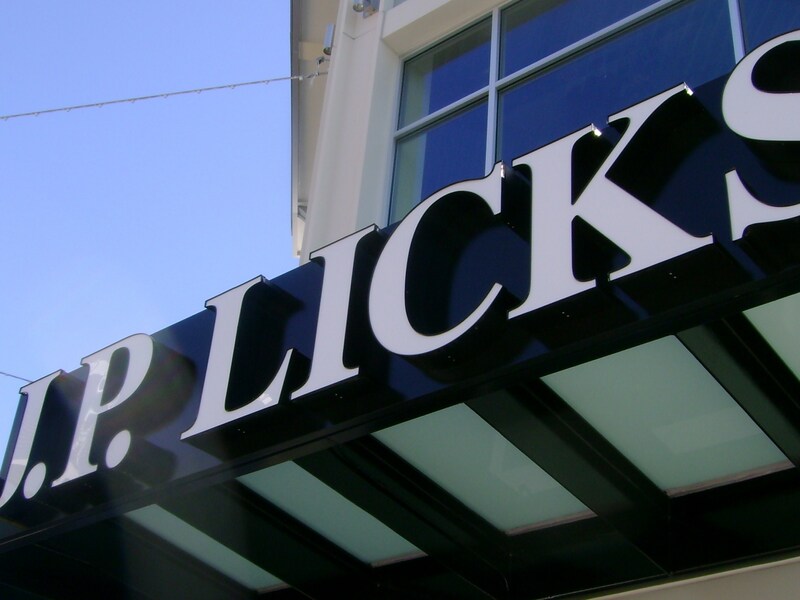 I’ve had a hankering for a J.P. Licks ice cream all week! 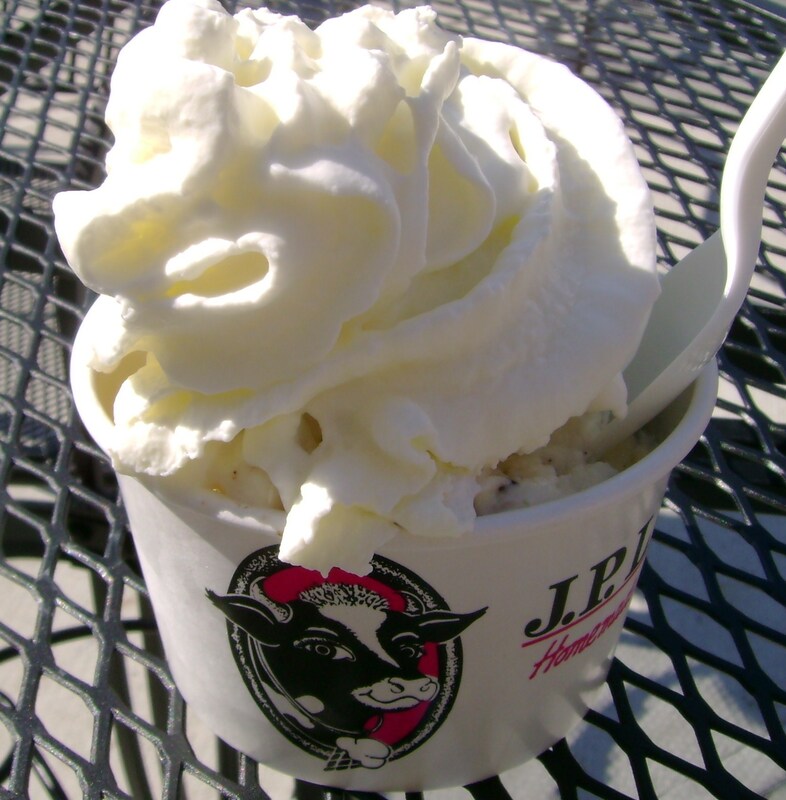 J.P. Licks is a local ice creamery that prides itself in wholesome, quality ingredients and fun flavors. The closest one to Brown is in Dedham(not close at all), so I was happy for the ride. This was so well worth the wait. I ordered a medium mint chip frozen yogurt with fresh whipped cream. I can pass up the canned stuff no problem, but if you tell me your cream is homespun, I need to take a taste 😀 The ice cream was so delicious! I love how J.P. Licks keeps the crap ingredients out: no fake green dye here. And lucky for us, in that same strip mall is New England’s largest Whole Foods! That’s my third favorite place from today. Can I tell you I was a little in heaven at this Whole Foods? 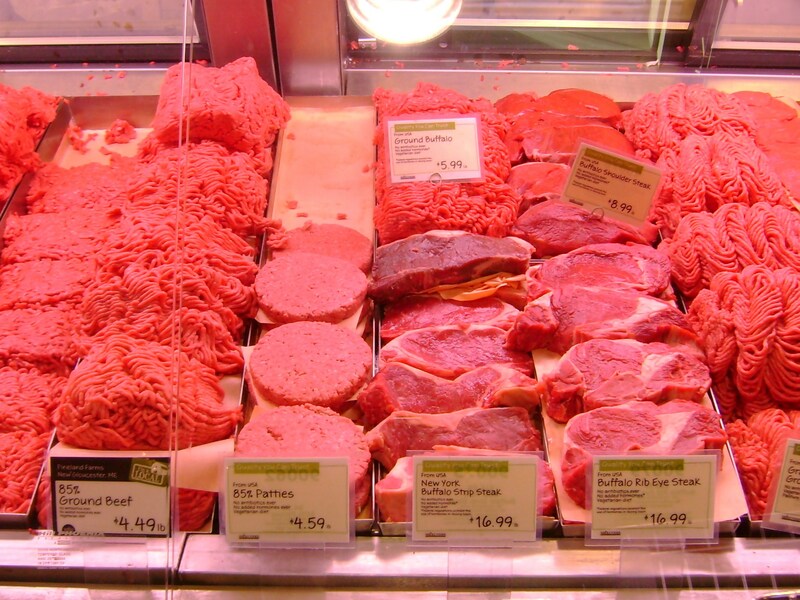 They didn’t just have the 85/15 grass-fed beef I was looking for, they had 85/15 local beef(from Maine) and 85/15 bison! I’ve never had so many choices when getting ethical meat before. 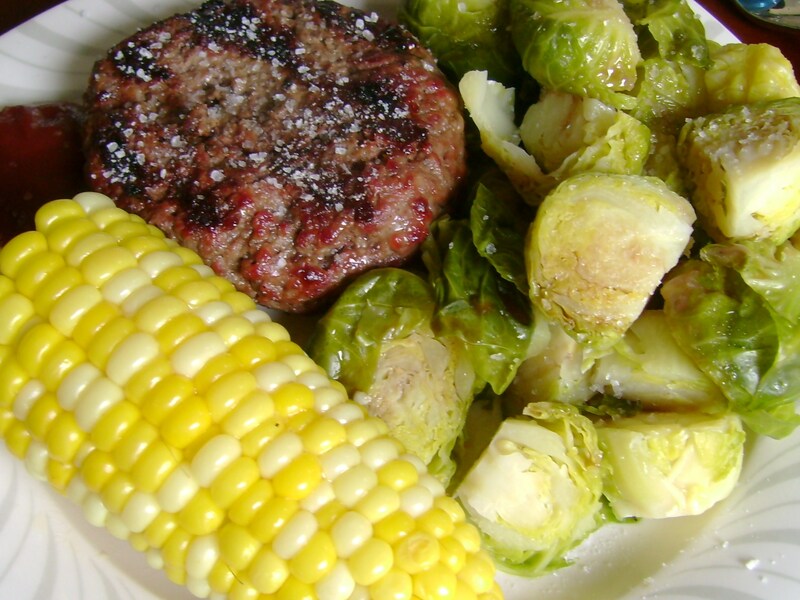 I stuck with the grass-fed, but the local meat was duly noted for the Summer grilling season. 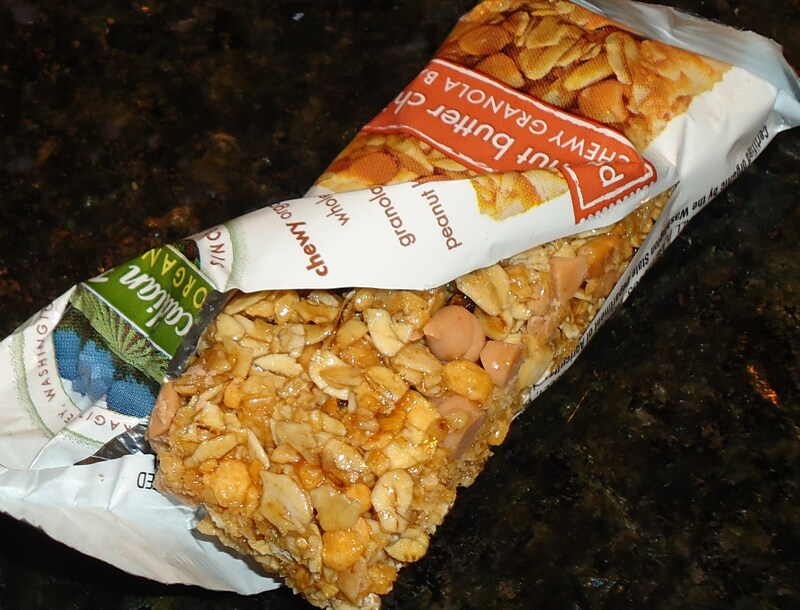 When we stopped at Eastside Marketplace on the way back to get some cheaper groceries, I snacked on a KIND bar. 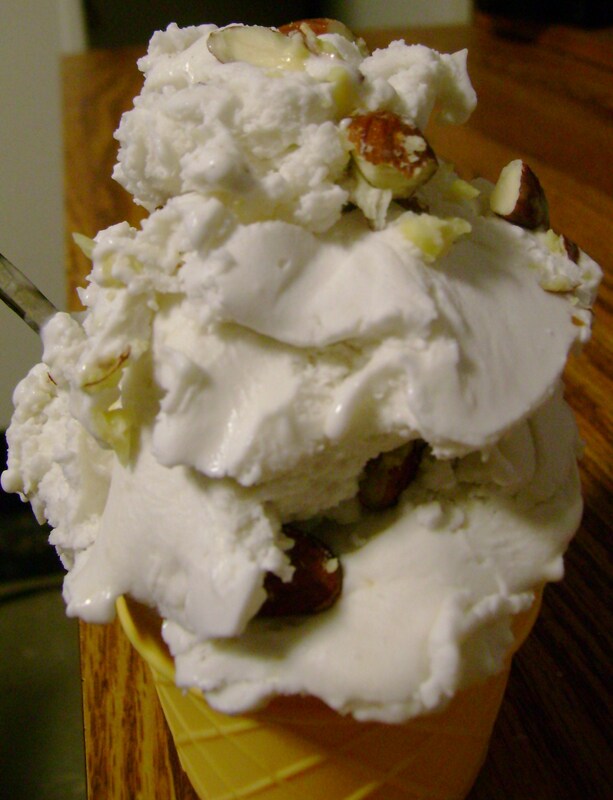 The ice cream was delicious but that low-fat yogurt is like a drink so some nuts were a good change of pace. I love a good grocery shop to prepare me for the week! And between sales and coupons, we saved $15 easy on all of that. This dinner was the perfect ending for today. 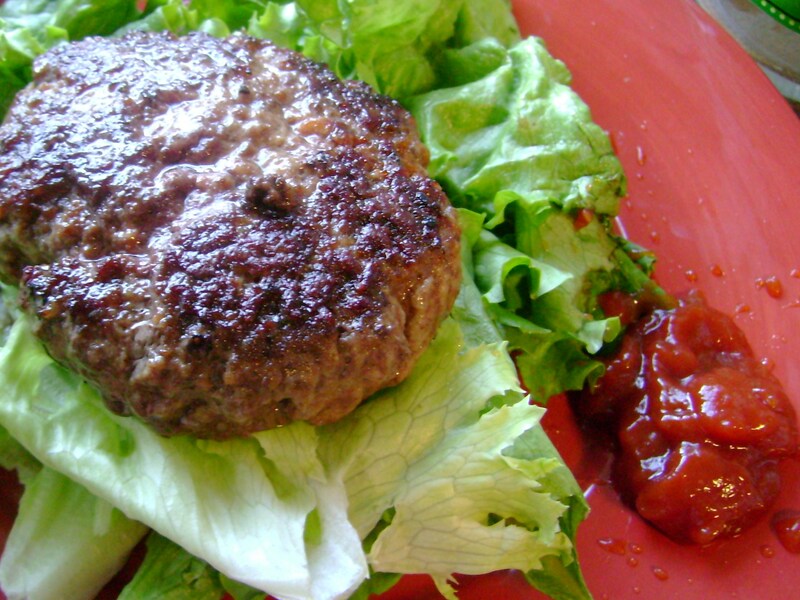 The fresh meat made for an amazingly juicy, delicious burger. 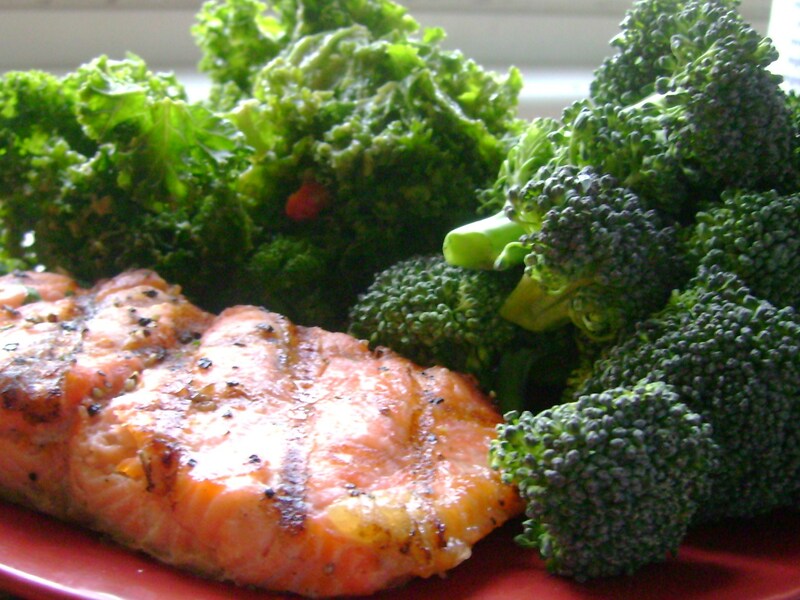 Instead of sweet potato fries, I wanted to get some greens in me for today. 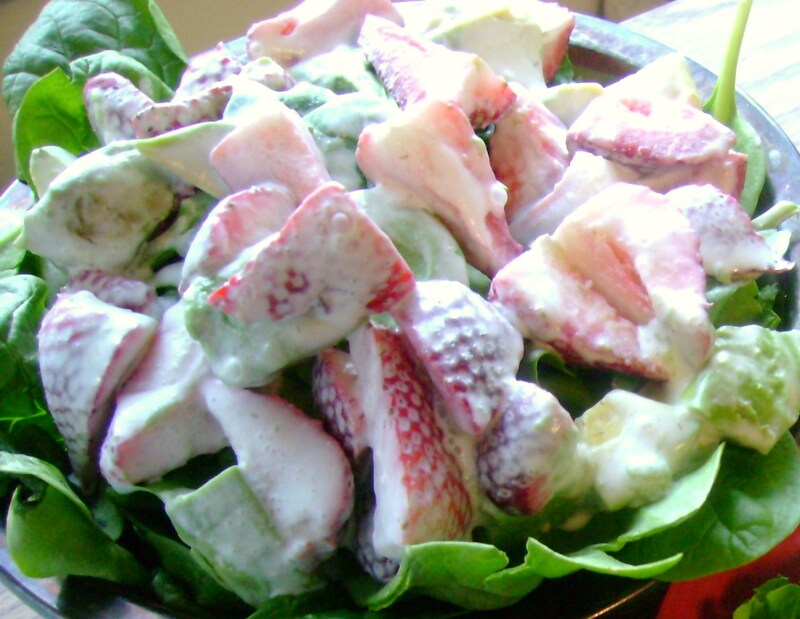 I made a salad with cut strawberries, avocado, and coconut milk. The flavor pairing was unreal here and it tasted just like I hoped it would. I just love the soft, rich avocado on salad. Where’s one favorite place you wish you could be right now? I could definitely go for an after dinner dessert at J.P. Licks 😉 Or I’d love to watch Date Night at a little 3-screen movie theater in my hometown they tore down around 7 years ago. This morning felt like the worst. It was hot. I was stressed. I felt lethargic. I had just about every negative word in the book to say. I wanted to run when I knew I wasn’t mentally “there”. I had a piece of Honest Foods‘ pomegranate walnut crisp granola plank, which was even more a tip-off I was stressed(granola is definitely my stress-food). 10 minutes later and I still wasn’t running or feeling any better. 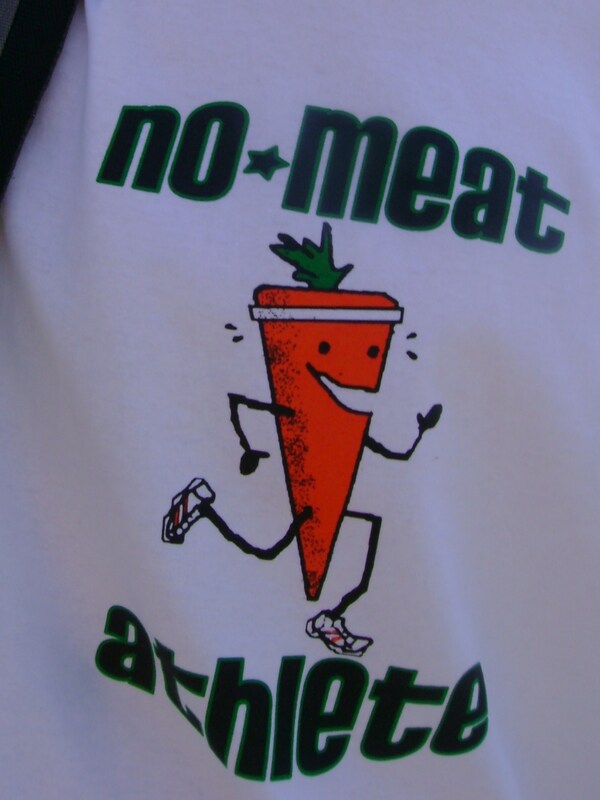 I put on my No Meat Athlete shirt today, hoping it would inspire me to run. Instead, it did something of the opposite and I couldn’t be more grateful: It reminded me that you don’t have to run to be a runner. I have a bad habit of forgetting and needing to relearn lessons, like why labels don’t matter. 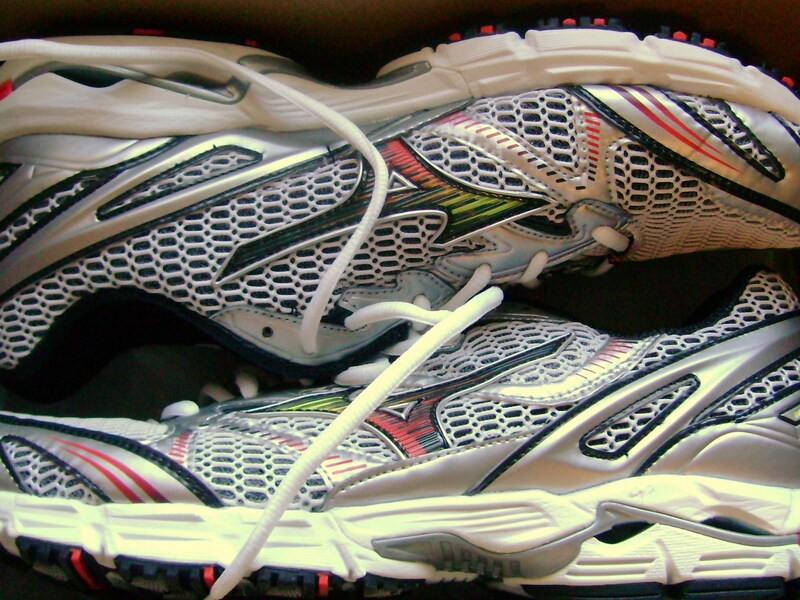 Today, I had to relearn that you’re just as much a runner on a rest day as the days you go out. Meghann and Ashley are just as much ultra-marathoners now, even though they aren’t currently running one. And we’re all just as much food bloggers as when we aren’t taking photos of our food. This lesson was in part learned this morning, when an update on the news about the West Virginian miners abruptly ended my pity party(please, pray for those families; it’s all they ask for). Part of it came in my Object History course when we did an exercise judging each other on our clothes. Immediately I was pegged as a vegetarian. I then had to explain why I wasn’t but still wore the shirt because I support Matt himself as a runner and the rights of ethically and naturally raised animals(touched on in my food philosophy). 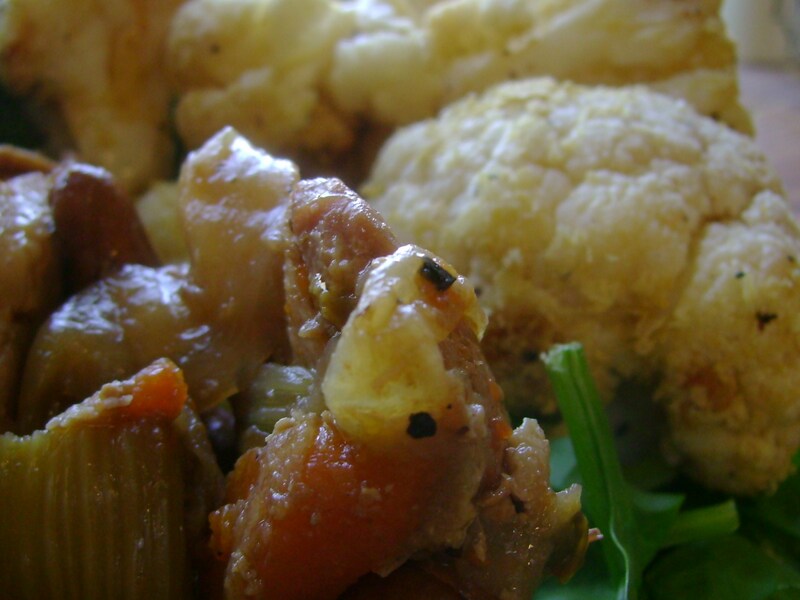 When I was asked if I was”OK” with people assuming I was a vegetarian, I didn’t know how to respond; of course I was “OK” with it, if the contrary opinion is that I could walk into a KFC and order some chicken without caring one bit about the animal that gave its life for that piece or how it was raised. 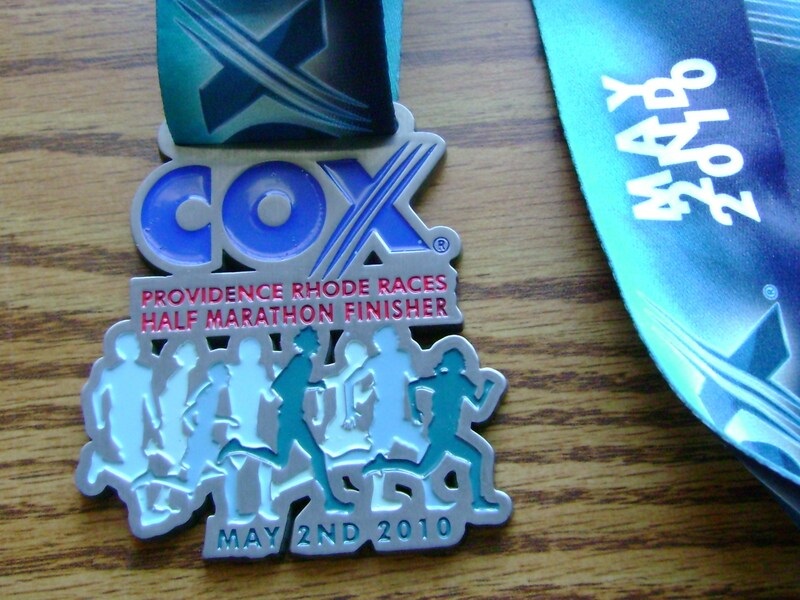 Even if I wasn’t running a half-marathon then or eating raw food I was just as much a runner and a raw food enthusiast. I didn’t have to be doing either to be either. That is what I learned in class today. 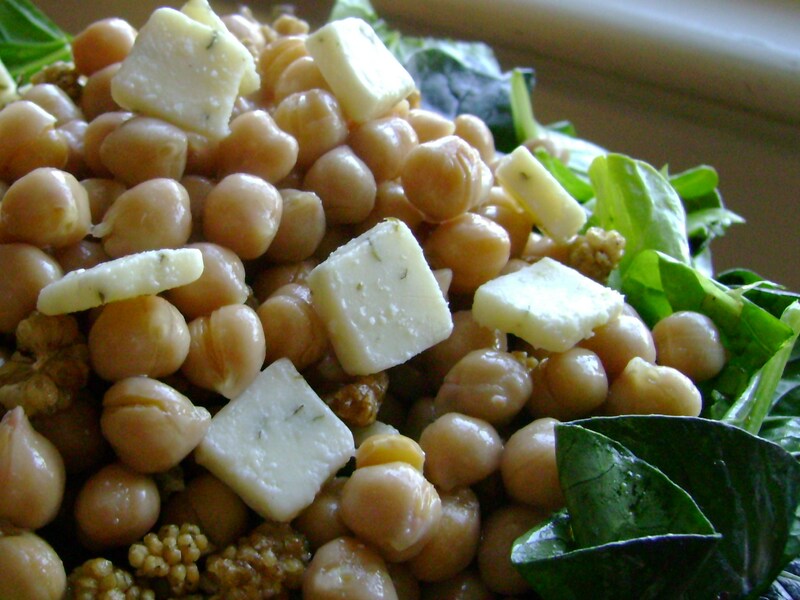 For lunch, once I decided to not run, I made a highly raw salad, with chickpeas, spinach dressed in Foods Alive hemp oil dressing, Next Generation Organic Dairy raw garlic parsley cheddar cheese, and my attempt at maple golden raisins. 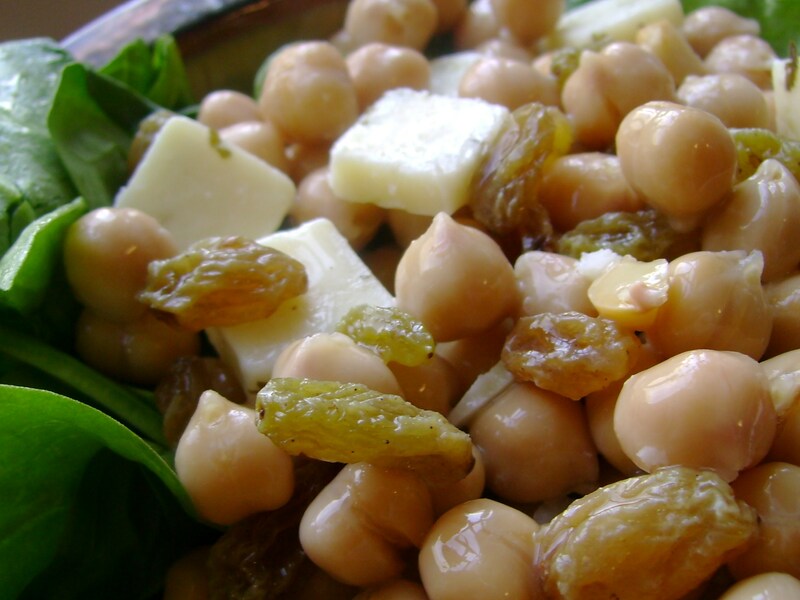 The organic hunza raisins were a new product from Tierra Farm. I wanted to rehydrate them in a mix of water and maple syrup; it worked a little bit and where it did was wonderful. But they needed much more time than the 1 hour I allowed. 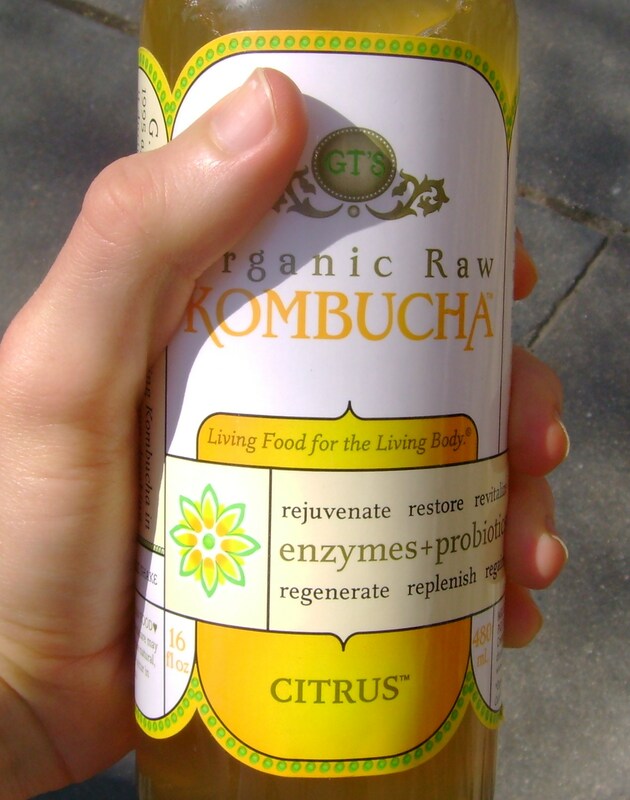 In the beginning of Object History I sipped on a citrus kombucha; the ginger and lemon reminded me of a vinegary, unsweet lemonade on this 90 degree day and was the perfect flavor. 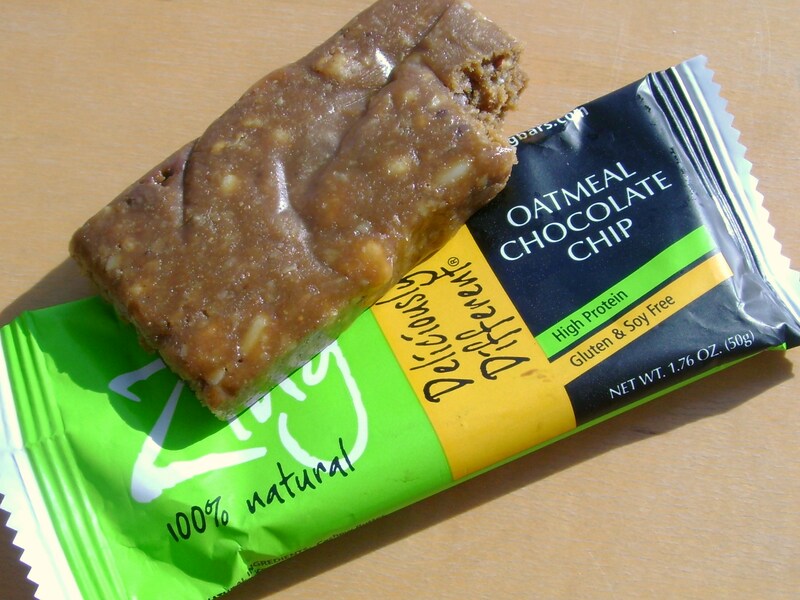 A little later on, I snacked on an oatmeal chocolate chip bar by Zing. I got the chocolate chip part, but other than that this was just plain ol’ sweet. What I really liked moreso was the nutrition. It had a good amount of healthy fat from cashew butter, 10g of protein, and was sweetened with natural fruit juices and agave. I would have thought all that nutrition would’ve stuffed me up. It didn’t. 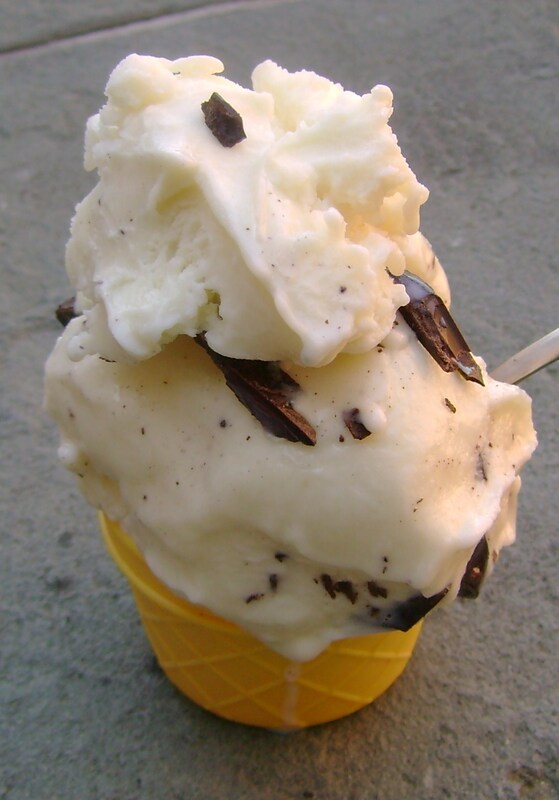 I was dreaming about this gelato all through class; how could I not outside on a 90 degree day? 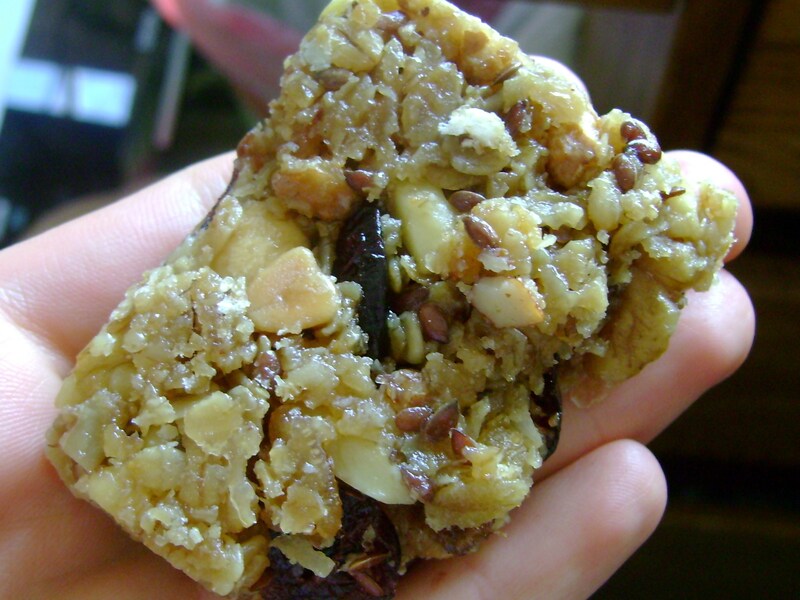 It tasted perfectly rich and sweet, and I ate it on my way to–drumroll–Whole Foods! I had a major salmon craving, and the weather was so nice. I couldn’t find a reason not to walk the 1.2 miles and pick up a dinner. Wow that post took a while! But I think it was worth it, and all stuff that needs to be said. Just because I haven’t been studying doesn’t mean I’m not a student, right 😉 And if this self-reflection helped or resonated with just one person, it will be worth it. G’night!